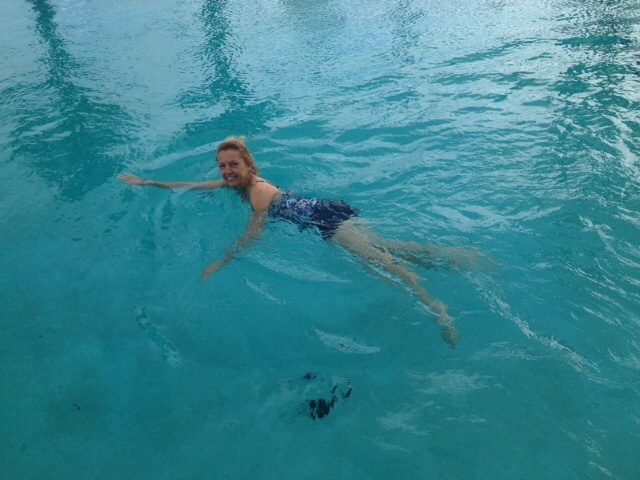 We are still in south Florida, poised and ready to make our jump to the Bahamas at the first weather window. More about that later. 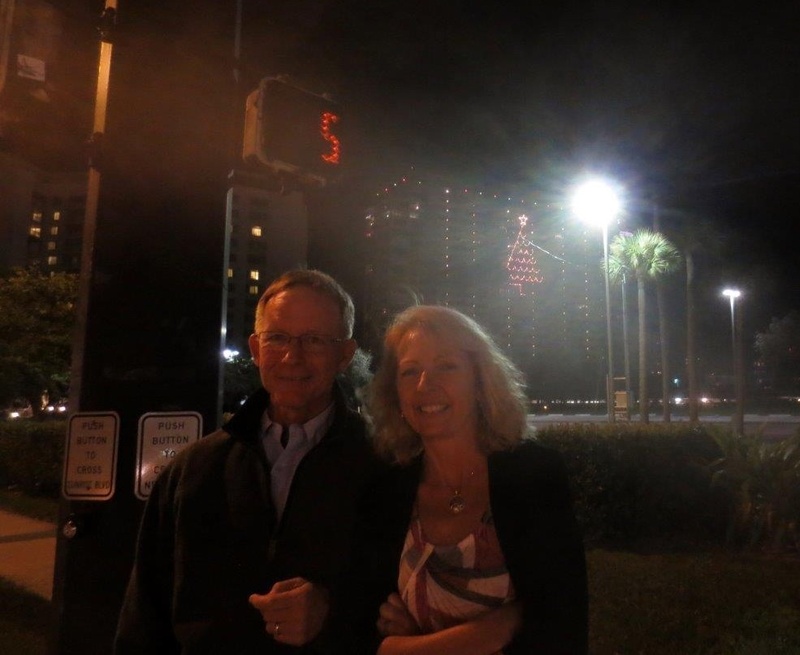 First, a little about our last few stops in Florida and Christmas. Vero Beach was where we left off. 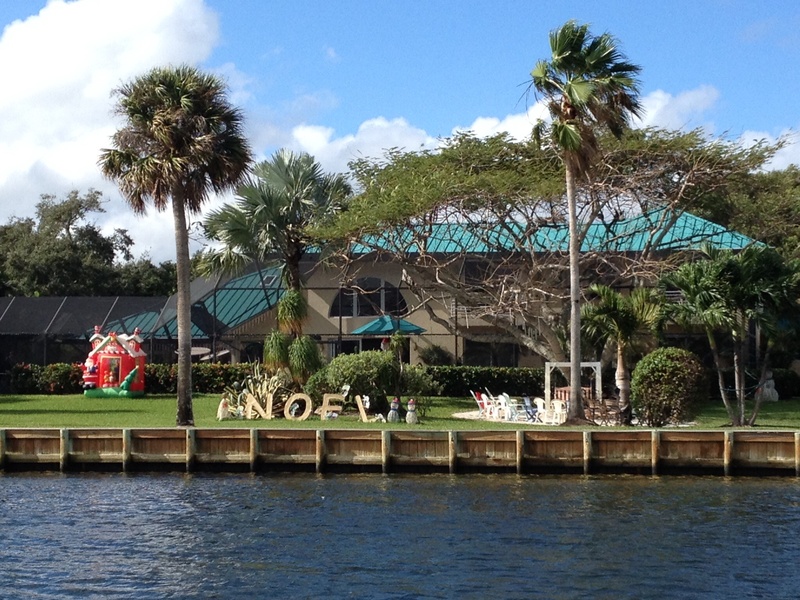 I remember being in Vero Beach as a child when my uncle lived there, but I couldn’t tell you much about it. 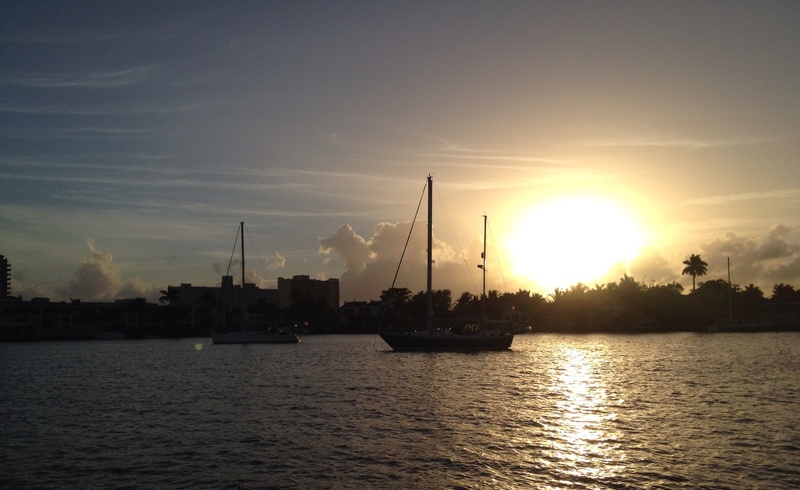 It is an EXTREMELY popular place for cruisers, and the mooring field at the City Marina can be a very crowded place. In the height of the season, boats may be rafted up three across on the mooring balls. We did, indeed, need to raft up, as seen in the picture below. Magnolia rafted with another boat on the mooring ball behind us. We planned to spend a couple of nights in Vero, so the ladies took advantage and suggested that the chicks head one direction and the guys head the other way for the day! Understand, we love our partners very much, but it is a LOT of together time on the boat, so all of us found it very appealing to go hang with “one of our own” for an afternoon! 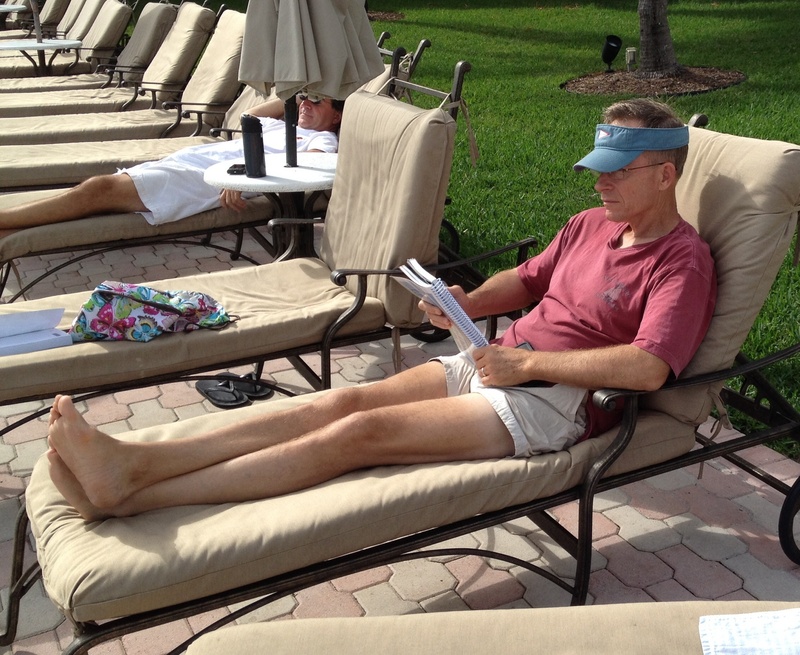 While prepping for this trip, we did a lot of reading by people who have done this before. One of the most highly recommended books to have on board is Men Are From Mars – Women Are From Venus. Of the whole Mars-Venus book series, someone should write the “Mars and Venus Living on a Boat” version. It was classic: Annette and I decided to go into town by the beach, walk the shops and have a ladies lunch out. The guys went to, like, the hardware store and shopping for electronics at Target and some other guy stuff. The ladies talked about family and people and whatever popped into our heads. We took our time . . . we didn’t rush. We lollygagged, in fact. When we told each other stories, we didn’t edit them down to the headlines . . . we elaborated. We happily went into detail! The guys probably scratched and grunted and exchanged a few very pertinent stories, but I would lay odds that none of the stories lasted more than 4 minutes. They got back an hour ahead of us and had the generators running on the boats while finding something that needed to be fixed. Moral of the story: everybody was happy at the end of the day from having time on their own planet. We keep reminding ourselves that it is okay – more than okay, it is downright HEALTHY – to get time apart on occasion. And the nice thing is that at the end of an afternoon like that, we’re happy to be back together again. Annette looking out at the beach during our ladies day outing. We went to a cruisers cocktail reception and then six of us went to dinner in town. 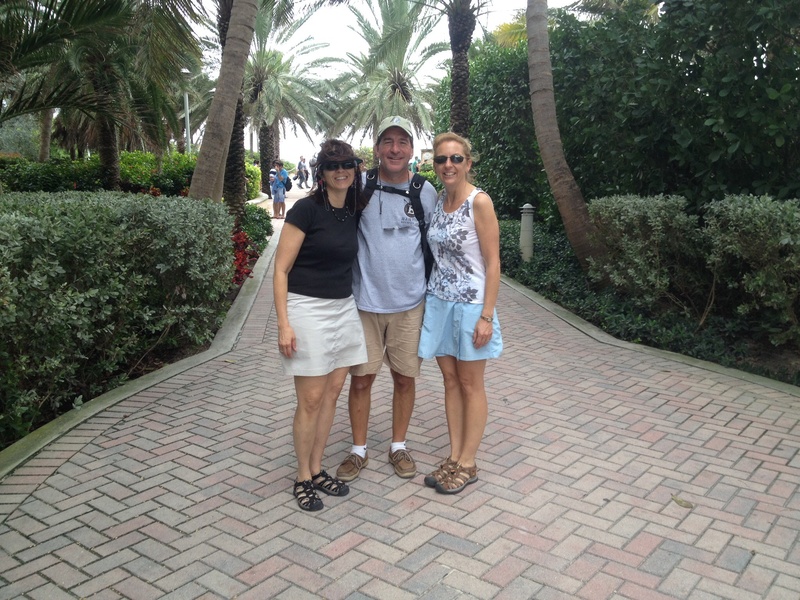 Annette and Anthony introduced us to a very nice couple on Journey who they had met a few weeks earlier. 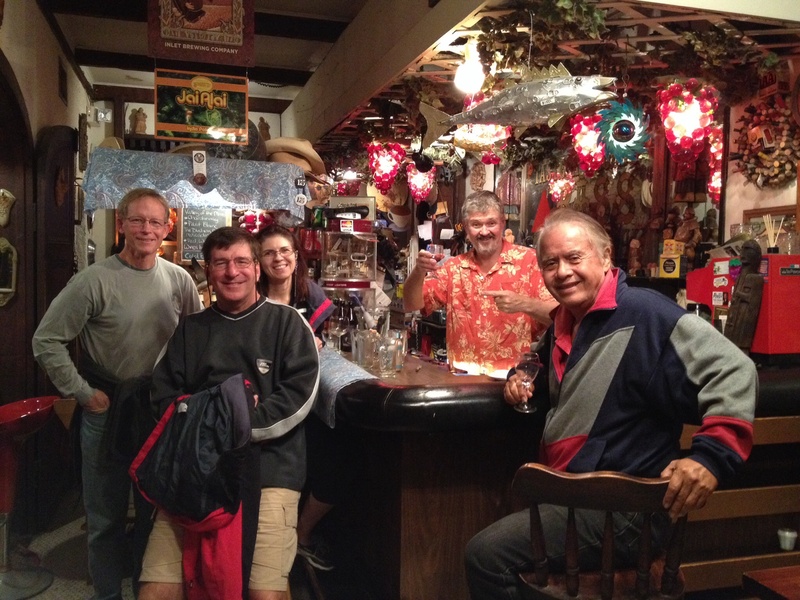 They had just begun their cruising days in November and we enjoyed sharing stories and plans over dinner. 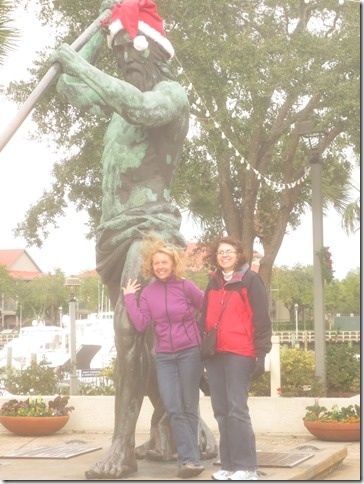 We enjoyed Vero and wished we had more time to spend there, but we needed to keep progressing south. It was onward to Lake Worth/Palm Beach area. It was a crowded anchorage and we found a spot parked outside of some nice real estate. Dinner was on Magnolia and we had a chance to meet their good friends and mentors Greg and Marie who we had heard so much about. Next morning, up and out early. 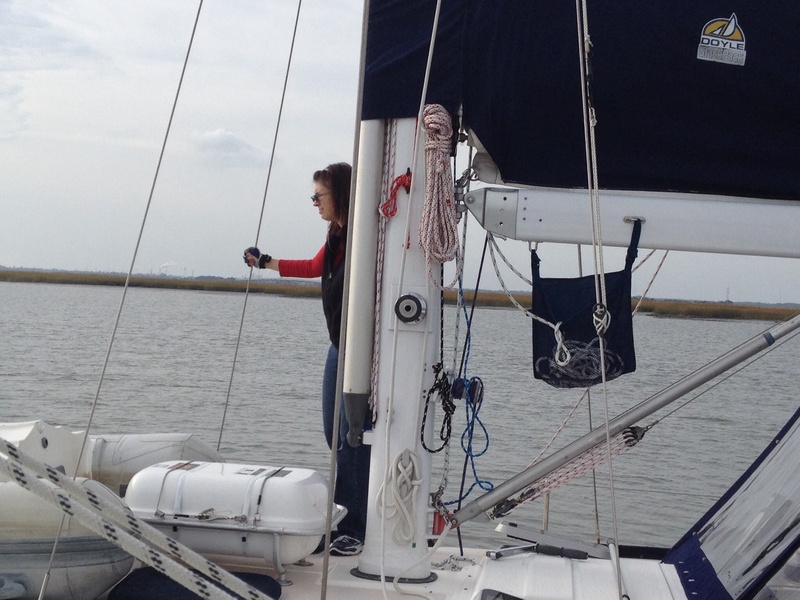 Although we had hoped to get off of the ICW and go outside, again the weather prevented us from doing that. The winds were just too snarly on the ocean. But we were determined to keep making tracks, so we prepared ourselves for what the day was going to bring: eighteen draw bridges. EIGHTEEN! Some bridges open on request, but a number of these bridges were on a schedule. It is far more complicated than you would think about to time your arrival at a bridge. If you’re too early, you have to do a lot of tricky maneuvering to “station keep” in front of the bridge, and when there are a lot of other boats, it gets more interesting. If you slow down too much so as not to arrive too early, you risk running into a current you didn’t expect and not making it to the bridge on time at all. It is pretty high stress and a very high level of focus is necessary. Frank does most of the time at the helm for this, but I needed to start getting more adept at the station keeping myself – he can’t be at the helm for 9 hours straight! 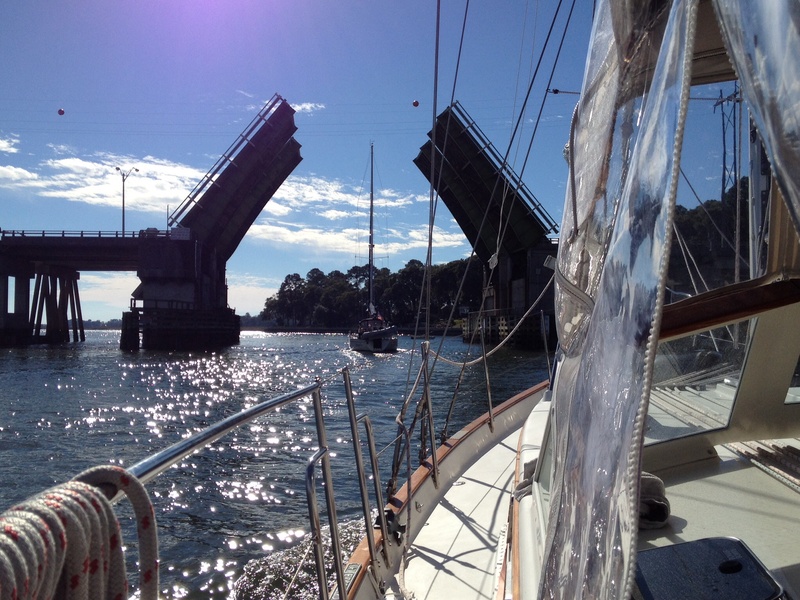 So I took my turn on a couple of bridges as well, learning the fine art of timing our arrival and keeping the boat in place in spite of the current. We had all agreed that we would get as far as we could until we got tired, or we’d go to Ft. Lauderdale, whichever came first. We did, in fact, make it clear to Lauderdale that day. Frank and I agreed that it was a cool accomplishment, an interesting (and scenic) day, and one that we would always remember. But we also agreed that we did not EVER need to do that one again! Eighteen bridges. Eighteen. EIGHTEEN! We were so exhausted when we got in. And the person not at the helm doesn’t get much down time, because that person’s job is to check to see when and where the next bridge is, to know what time it opens, and often to call by cell to confirm this because there have been some changes to the schedules since our guide book was published. And every bridge tender has to be contacted by radio by every boat. Just listening to the radio chatter that day was tiring! I must say that only two of the eighteen bridge tenders were total grumps; the rest were quite congenial. There is an art to being a good tender. Frank stuck his big Navy hat on my little head just to crack himself up. Seriously, he has a really big head. It looks normal enough, but go try to find him a hat that fits! It’s BIG! The further south we went, the more expensive the boats and the houses got. Ah yes . . . a reminder that it’s the Christmas season! Almost forgot . . .
As we passed some of the golf courses, we looked longingly and tried to remember the last time either one of us played the game. West Palm Beach area . 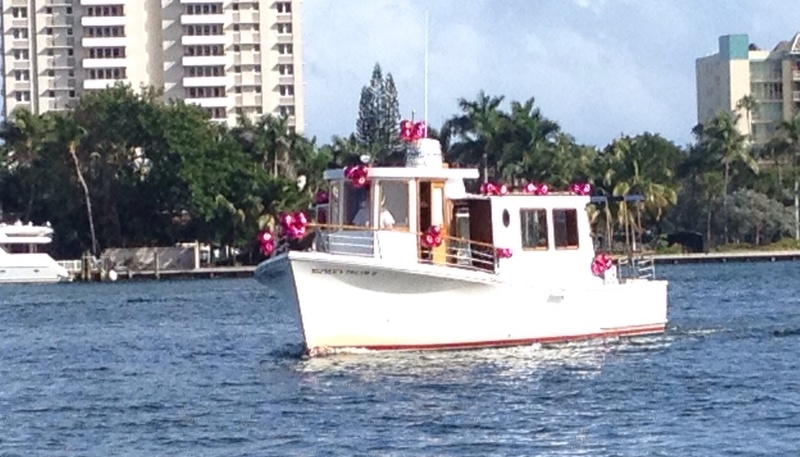 . .
Red Christmas balls adorn this boat. One of the eighteen bridges! Happy crew on the Eleanor Q towards the end of a long day. Picture by Magnolia. 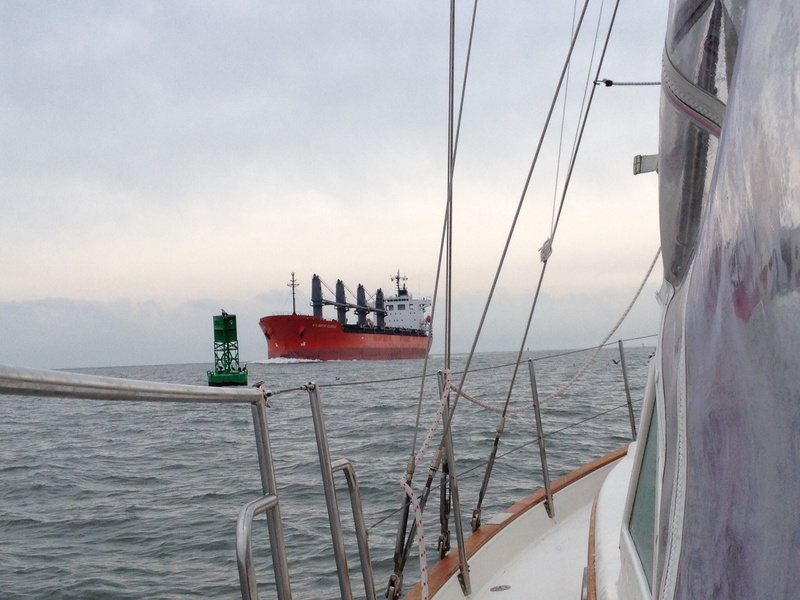 And finally settled at anchor that evening. 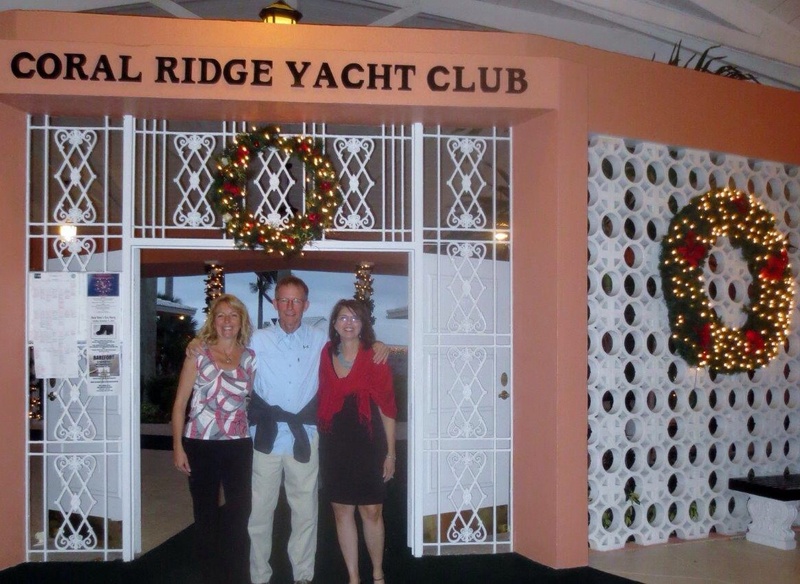 After anchoring for the first night, we moved right next door into the Coral Ridge Yacht Club to stay through the holiday. We would use this as our last opportunity to really do final preparations and provisioning for our trip to the Bahamas, plus we would enjoy the holiday. 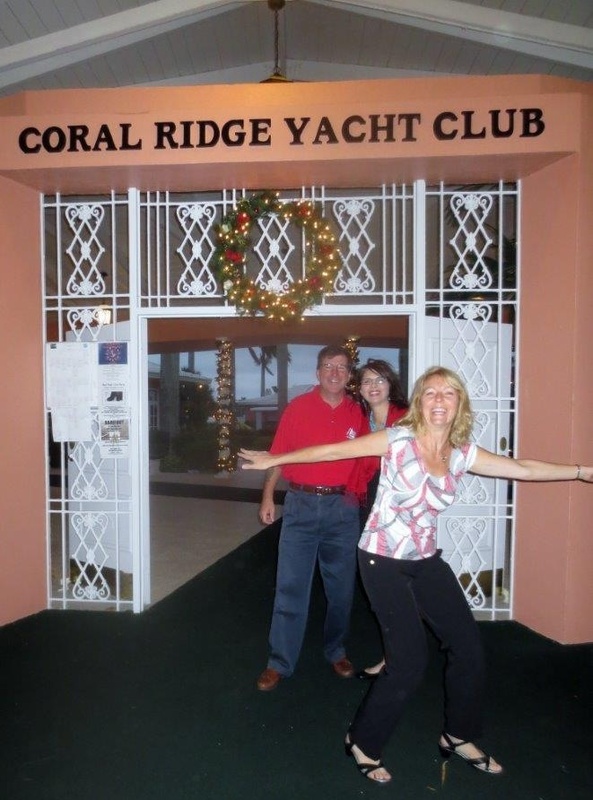 Coral Ridge Yacht Club – a very hospitable place! The four of us put on “real” clothes and went out for Christmas Eve dinner. Frank was trying to take a nice picture of Annette and Anthony . . . and I had the urge to photo bomb them. Couldn’t help myself. Walking to dinner . . . lights on the sides of the buildings. 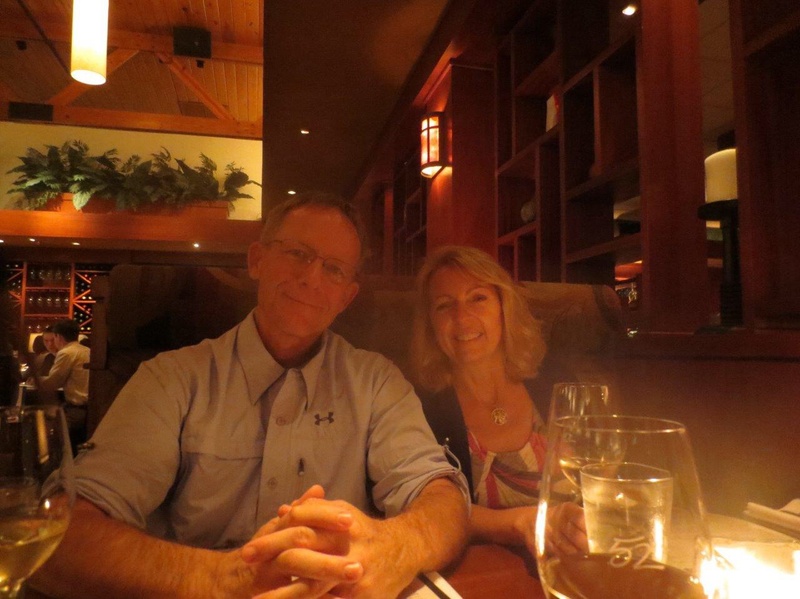 We enjoyed dinner at the Seasons 52. This is the first Christmas that Frank hasn’t been employed, and he has always made a point of making an appearance at work to show support for those who have to work the holiday. Well, old habits die hard, because he kept thanking all the employees for working on Christmas Eve and asking them what time they were getting off of work and making a big fuss over all of them. I had to remind him a couple of times that he was off duty and that this wasn’t the restaurant in the casino!! It was very sweet. So what did we do on Christmas Day? Magnolia hosted Christmas dinner and we had another nice night of camaraderie, good food, and good fun. We were all missing our families, but we made the best of the situation and had a nice day together! The next day was a work day . 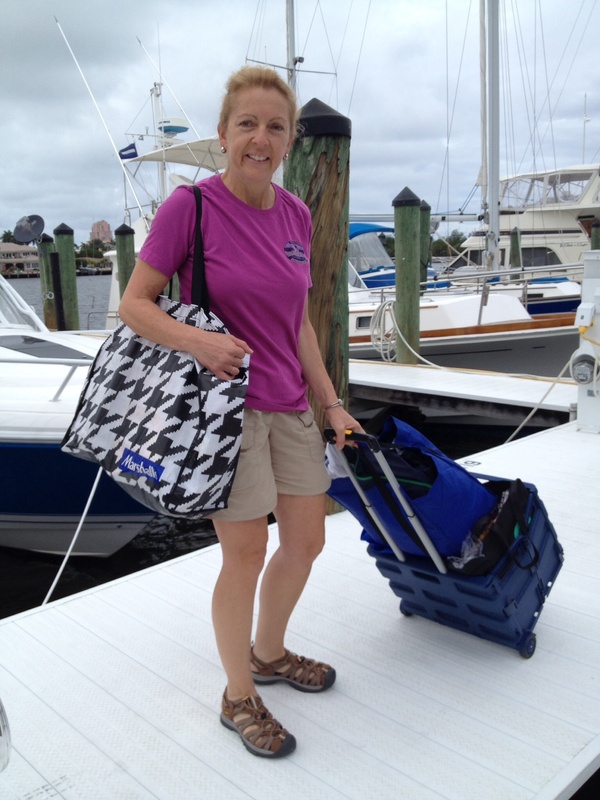 . . laundry, grocery shopping and boat maintenance! We did a good job of dividing and conquering chores that day. Back from the grocery store. And then Friday, we took off for Miami. 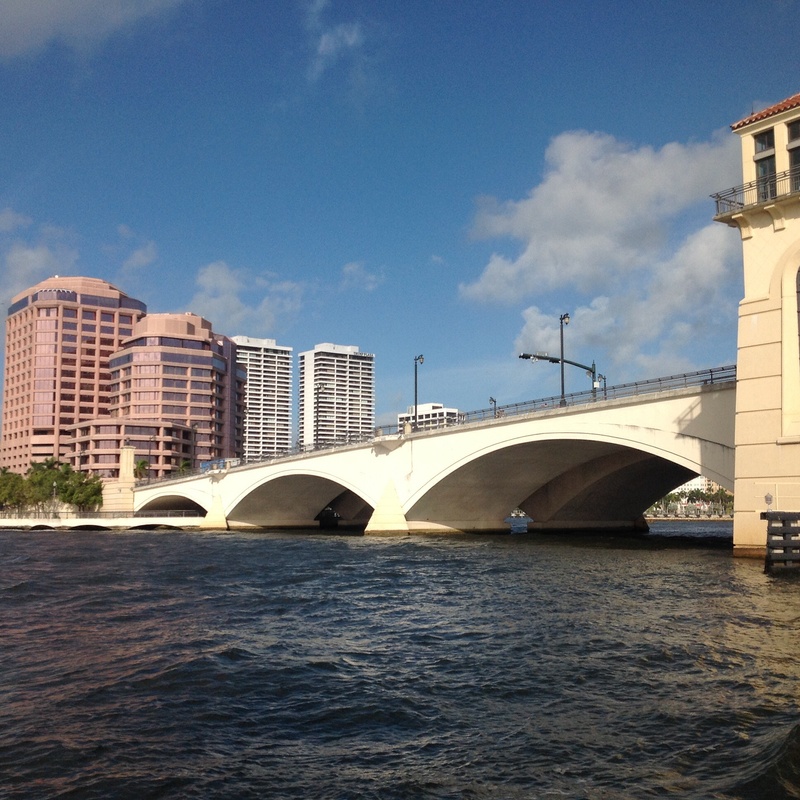 Still had to go through one more bridge before getting to the ocean to travel down to the Miami area. We can’t take the ICW to there (as is the case for most sail boats) because there is one fixed bridge that was built some time ago that is lower than the height of our mast. It was a good day on the water and . . . gasp . . . we saw those white things that flap in the breeze come out and our engine was turned off for a couple hours of the trip! Yahoo! 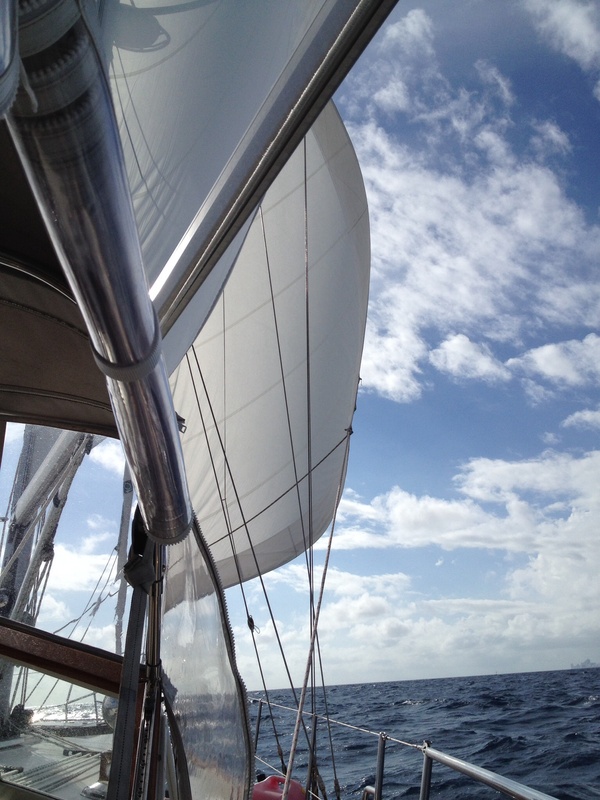 Sails up on the way to Miami! 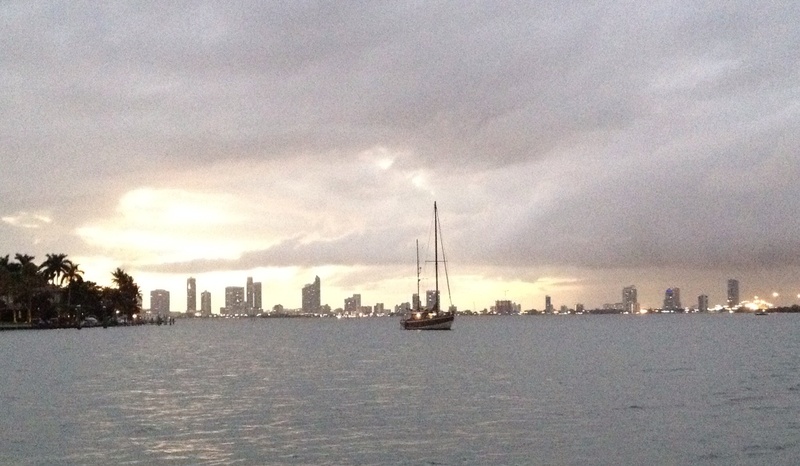 Magnolia caught this picture of us in front of the Miami coastline. 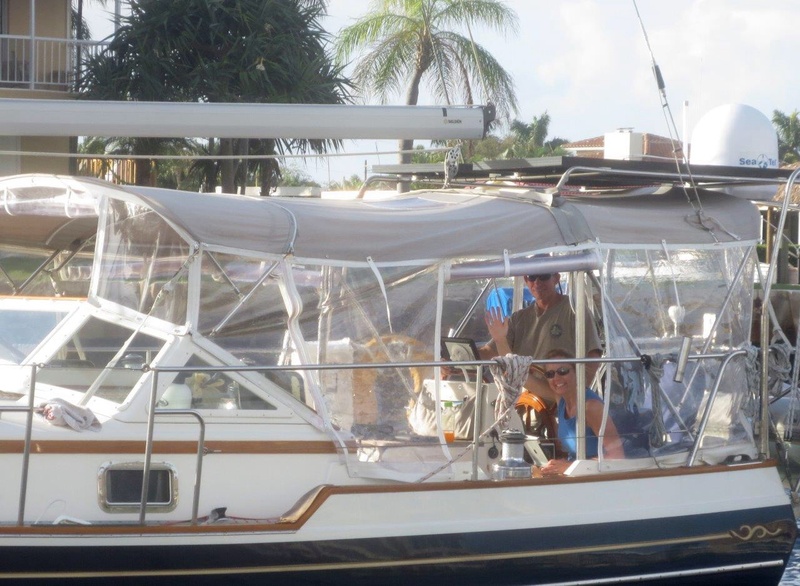 We got into Miami and anchored in Sunset Lake for a couple of nights. 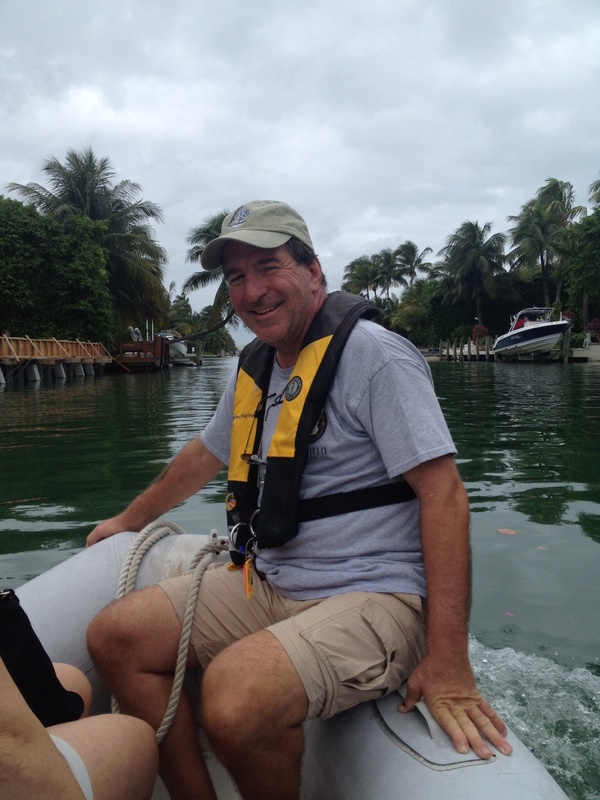 From there we could take the dinghy in and explore Miami Beach/South Beach area! The four of us took a dinghy ride to walk into town. 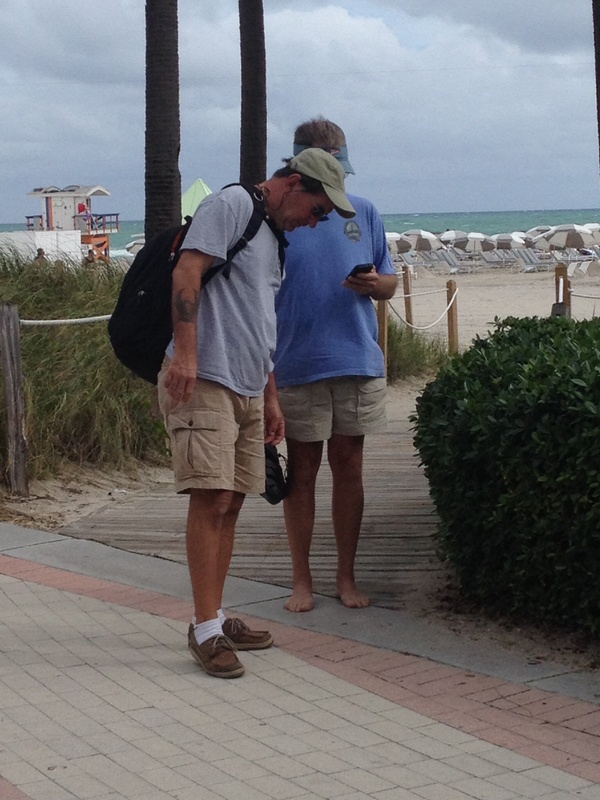 Walking around South Beach for the afternoon. 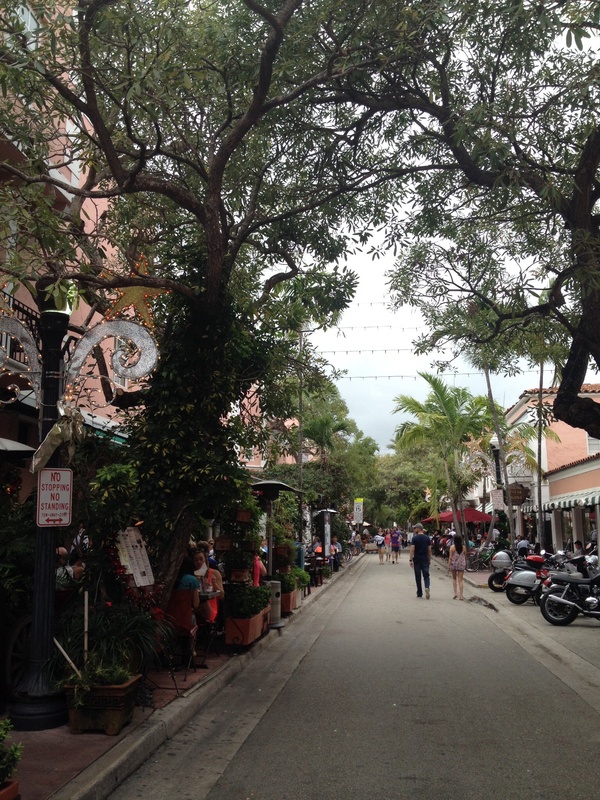 Espanola Way in Miami Beach where we enjoyed a delicious Cuban meal. 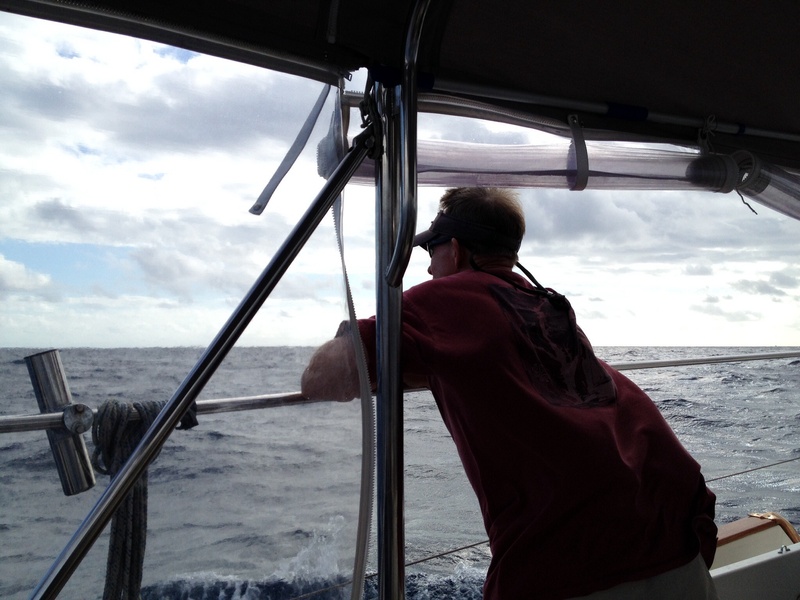 The guys conferring on Chris Parker’s latest weather forecast for passage to the Bahamas. Today we moved to an anchorage south of Miami and closer to the ocean where we will leave tomorrow for our big adventure to the Bahamas! 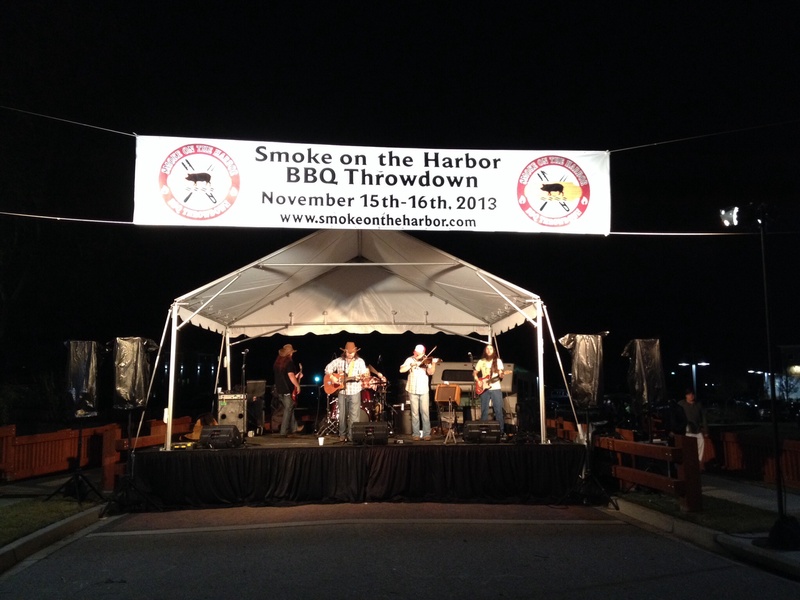 We are parked outside of No Name Harbor . . . I swear, that’s its name! 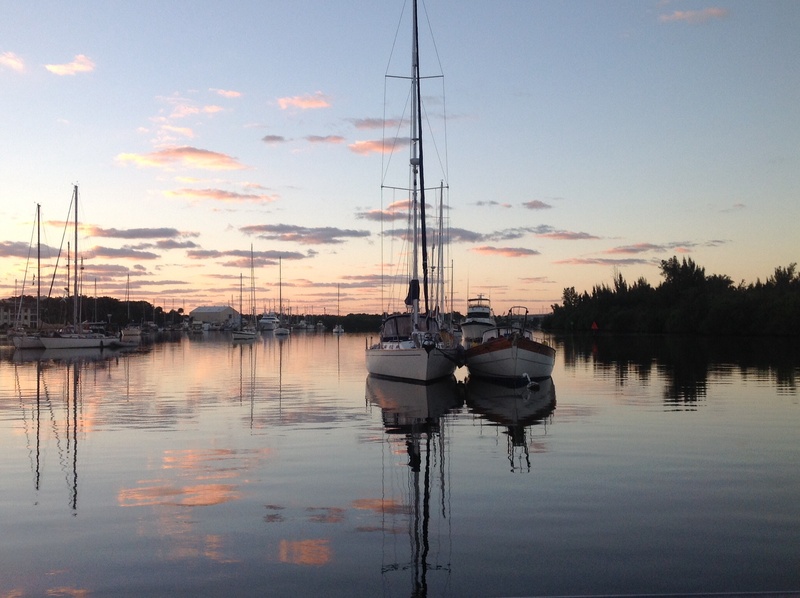 Anchor up at first light and off to Bimini! It is only 40 some miles as the crow flies, but the Gulf Stream will pull us north for a while and our path will essentially be in the shape of an “S”. Tomorrow we will try to hustle to the local phone office to set up new phone numbers while we are in the Bahamas and to get a mobile WiFi unit hooked up. Our US phones are not usable in the Bahamas, so our current phone numbers will be useless for the next few months! We are hoping that we will be happily surprised by the amount of connectivity we’ll be able to have, but only time will tell! Wish us luck! 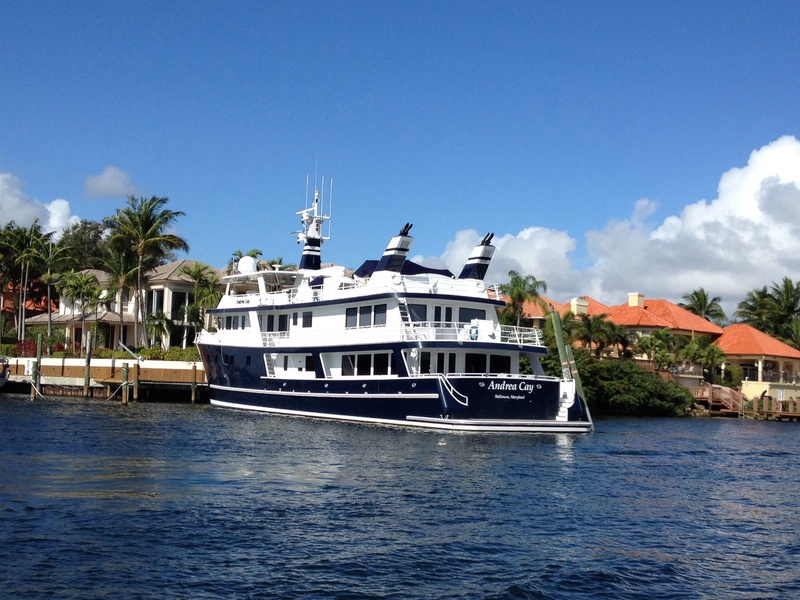 New Years in Bimini, here we come! 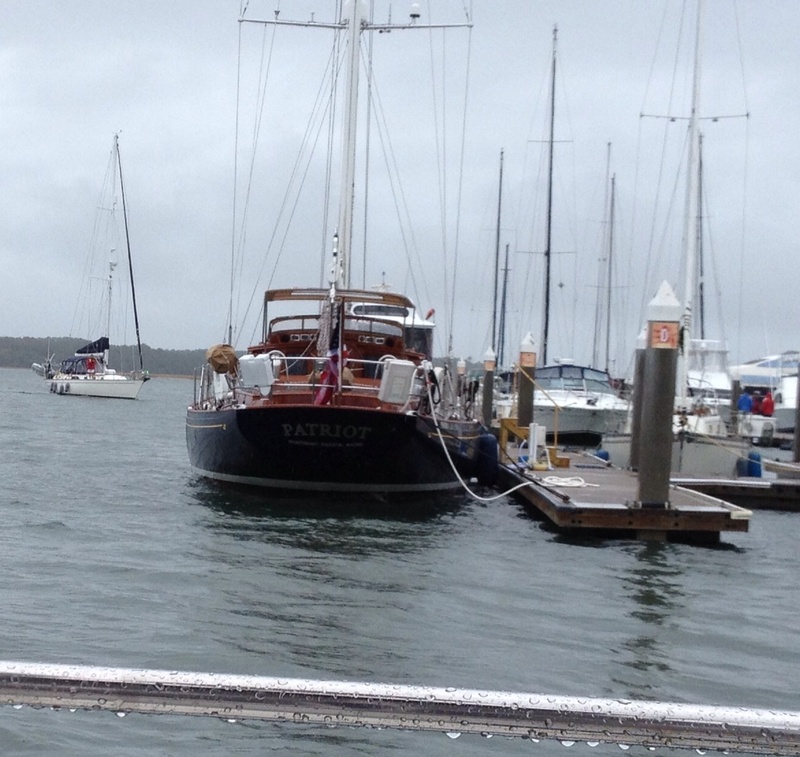 Magnolia sitting ready in the anchorage for our departure tomorrow morning. All we can say is “Ahhhhhhh…” Yes, people, after months of listening to us WHINE about being cold in Maine this summer and being cold going south this fall, it appears as though we may cease and desist with the whining . . . we are warming up! In our last post, we had made it to Florida. We left Georgia via St. Simon’s inlet and went “outside” into the big old ocean to make our last get out of the state of Georgia. It was a nice day and things were going so well that we skipped the inlet at St. Mary’s, Georgia and kept right on going to the inlet at Jacksonville, Florida instead. Although this looks like a picture of Eleanor Q at first glance, it is not! 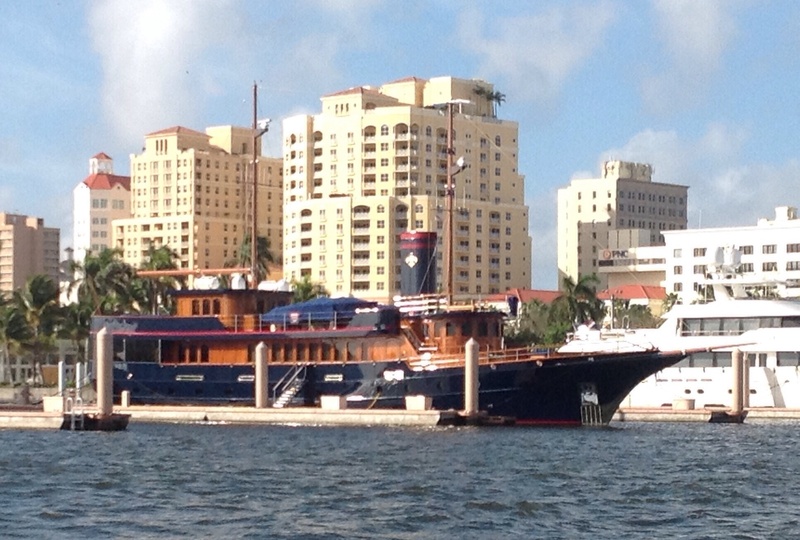 It is “Slow Waltz,” our little sister ship – a Gozzard 37′. 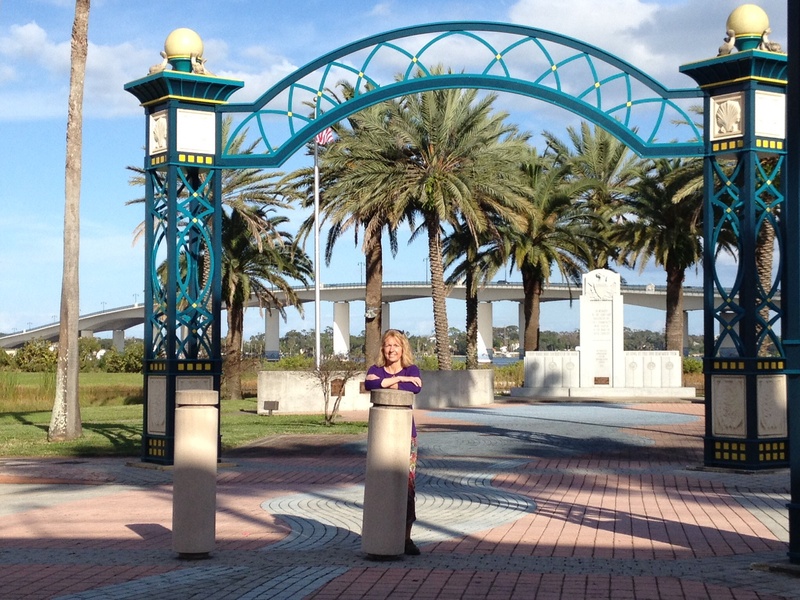 We had an interesting occurance in Jacksonville – we briefly ran aground. After receiving some less than accurate information about the water depth at one of the two free city walls in Jacksonville, we ran hard aground on our approach. 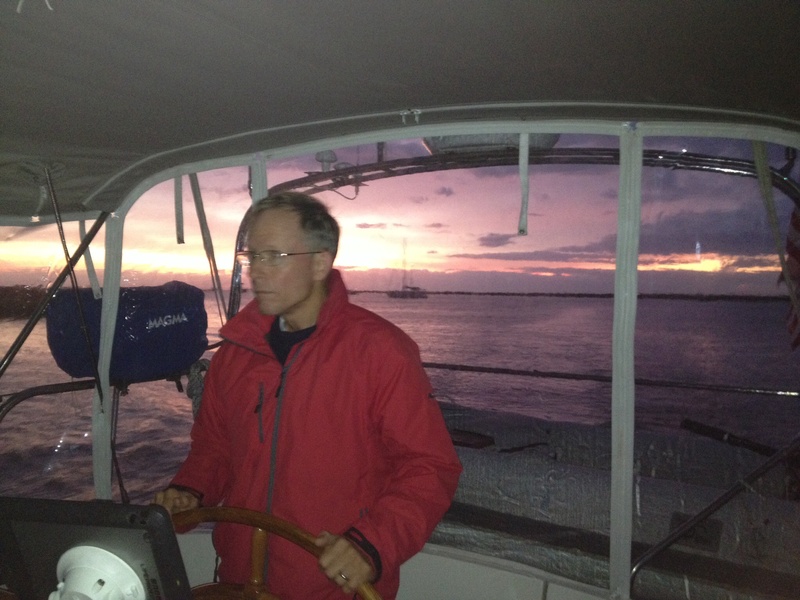 Frank was at the helm and I was poised at the ready to loop a line around one of the cleats when we just stopped. We couldn’t have been more than 15 feet from the wall! No panic. Frank came up on the bow and spent a few minutes trying to lasso one of the cleats, which he did. So there were two bits of good news: 1) We knew the tide would start coming back up in about 30 minutes, and 2) we had a line on the cleat, so we weren’t going anywhere. So . . . wait we did. With each little inch the tide gave us, we pulled in a little closer. Finally the tide came up enough to lift us just off the bottom and we pulled up to the wall. We did that long enough to assess that we did not want to stay there overnight since we’d just end up hard aground again at the next low tide! We pulled around to the other free wall with deeper water and got the last parking space of the night. 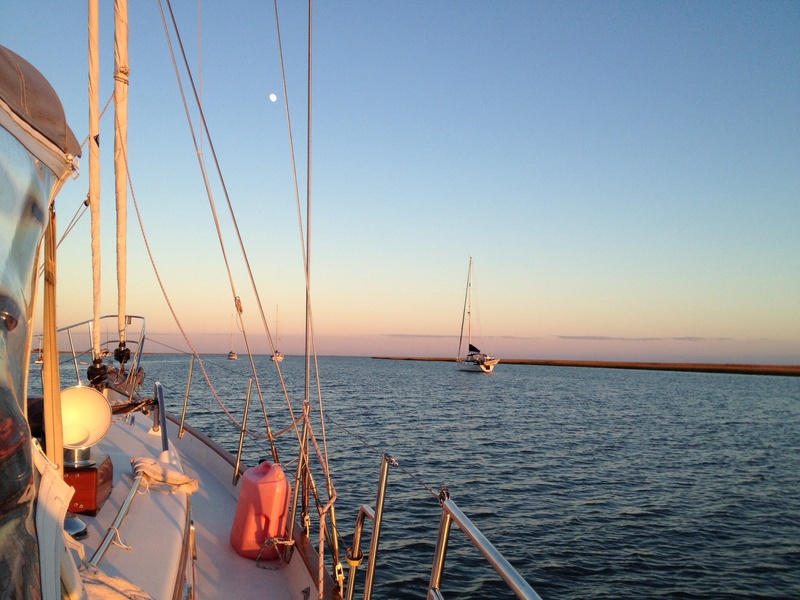 Once we got settled in, it was a great place to tie up and we chatted with very nice fellow boaters. After a short night, we were off and running again the next day. After all . . . we were still trying hard to get further south! Next stop: St. Augustine. We really enjoyed the town and found a terrific marina to stay at within walking distance of town and all it had to offer. We found good restaurants and really good music. First stop on our first evening: a wine bar with Anthony and Annette. And we picked up a friend or two along the way! 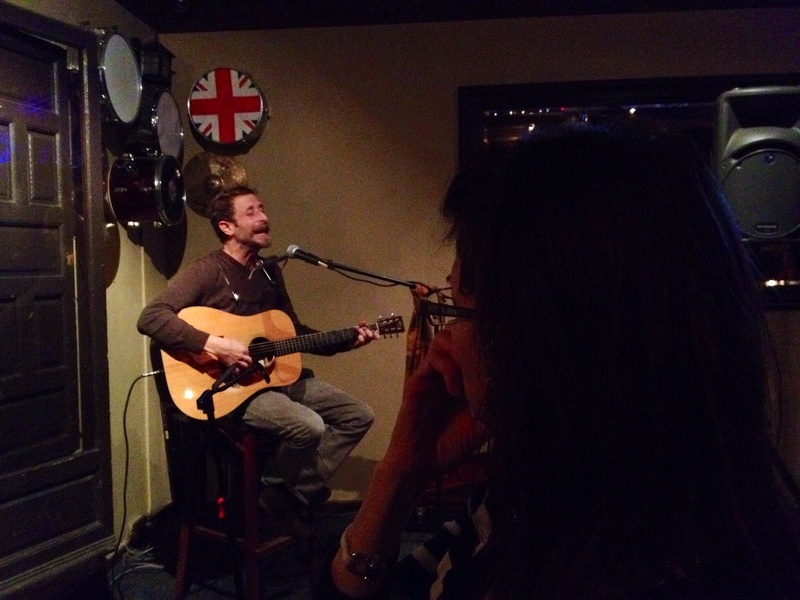 Then we found some great live music in St. Augustine – acoustic guitar and vocals . . . outstanding! Annette listening intently. A reminder that Christmas is coming . 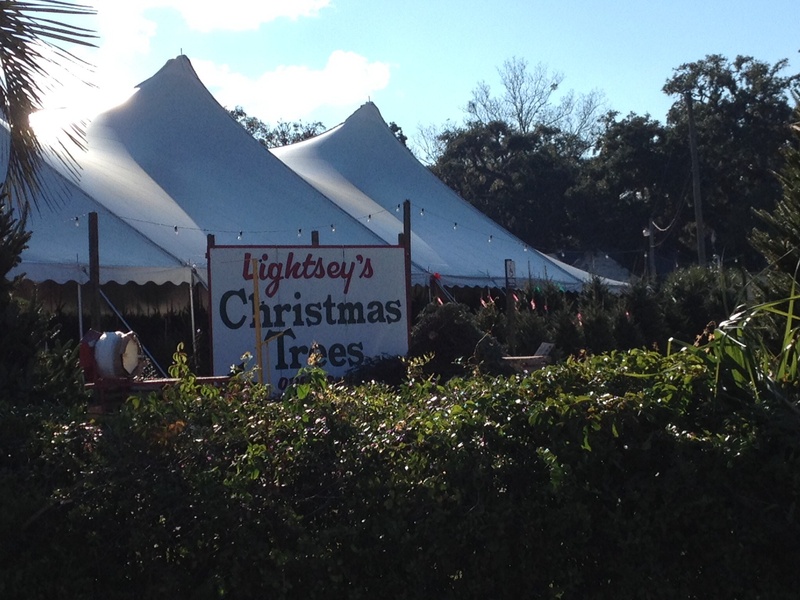 . . Christmas trees for sale in a palm tree lined lot. 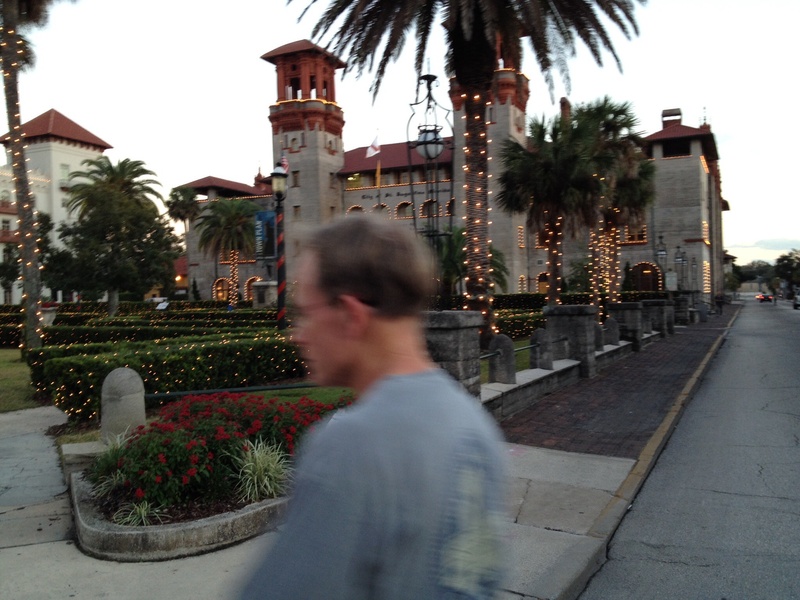 Frank was able to reconnect with a high school class mate who lives and works in St. Augustine now. John was a delightful host as we visited the restaurant where he works . 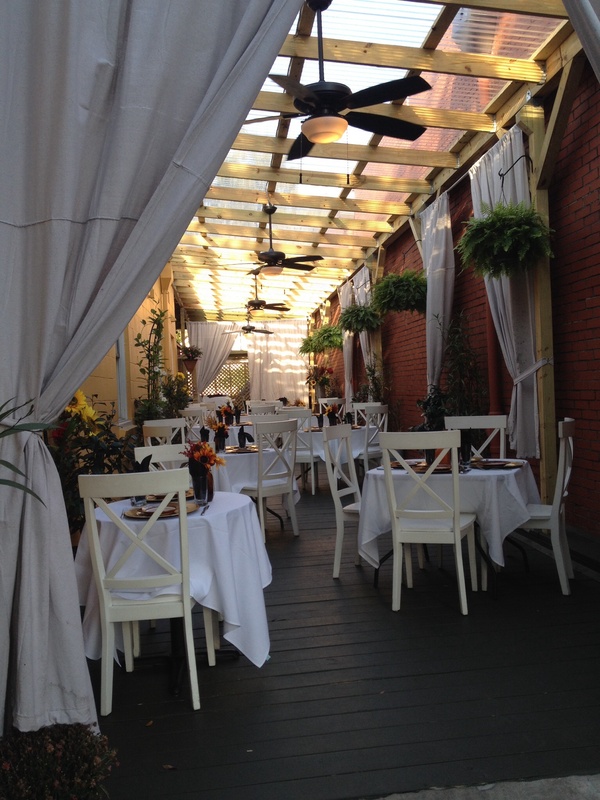 . . a piano bar and restaurant with great food and music. Now if only I had remembered to take a picture of the two of them together!!! Argh. Nice seeing you, John! 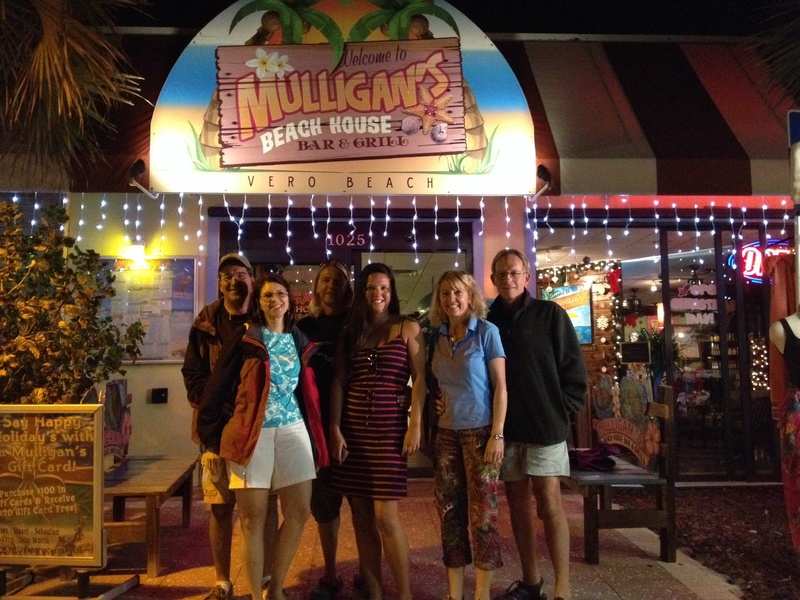 Magnolia’s crew, once again, met up with us there and then, after dinner – well the picture says it all! Of course . . . ICE CREAM! 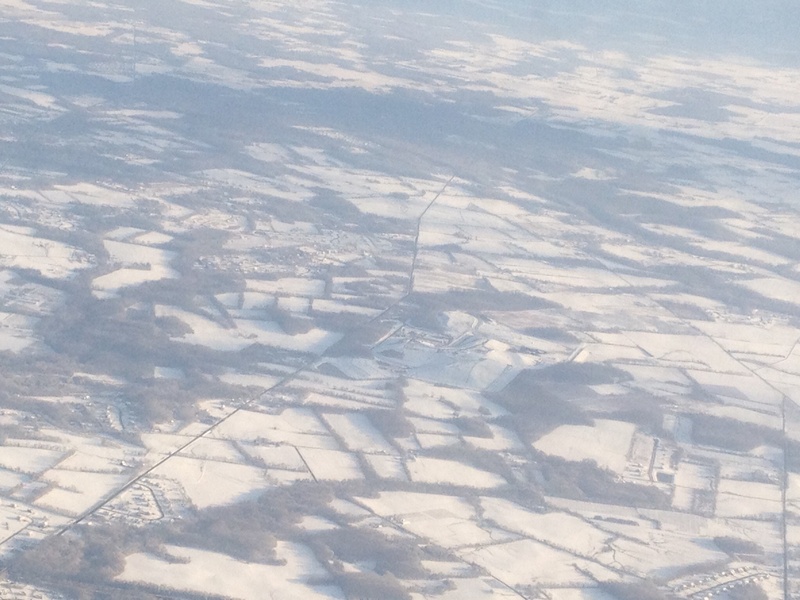 Frank and I knew that we wanted to fly back up to NJ some time in December to see our families before the holidays. We couldn’t plan it very far in advance because we needed to feel our way through the logistics of leaving the boat parked in Florida for a week. 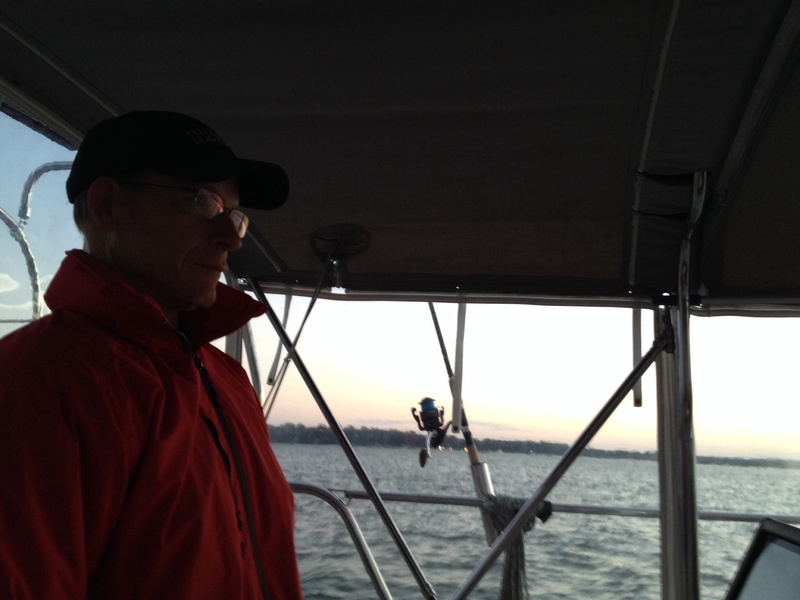 We had to find a place that was reasonably priced and where we felt secure leaving the boat. Hidden Harbor Marina was the perfect place, and so we quickly made some travel arrangements and buzzed up to NJ for a few days. We got there just in time for the first major snow of the season. Ugh. But we were thrilled to see some family! 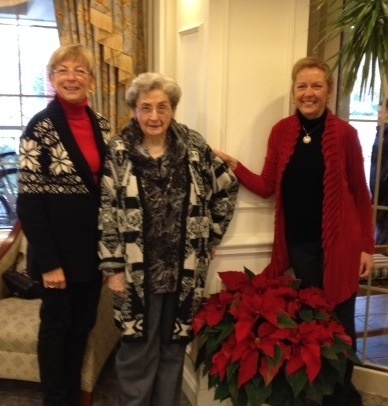 MaryMarie got to hang with Mama and sister Christine! I think we both felt a little disoriented dropping in to our “other” life for a week. One of the odd things for me was putting on “real” clothes! The day we were to fly back to Florida it started snowing again, and our day started with our first flight out of Philly being canceled. Fortunately, we were able to do some finagling and managed to end up back on the boat by the end of the day as planned; we just didn’t take the exact route we had planned! 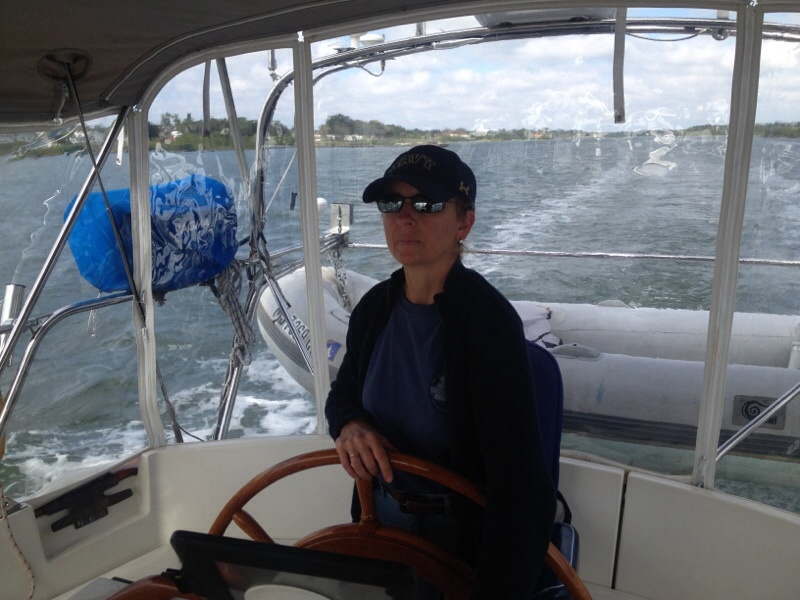 Back in Florida, we took one more day in St. Augustine to do some much needed boat chores and to start provisioning for our trip to the Bahamas. Certain things are not as accessible in the Bahamas, and when you find them, it’s expensive, so it is advisable to stock up on supplies before going over. After being parked in the same spot for more than a week, it was time for Eleanor Q to move on! Next big stop: Daytona!! Pelicans watching us make our way through one of the bridges. The last bridge before our stop in Daytona. Ems has some very dear friends who live in the Daytona area! A part of the gang from Bethlehem, PA were reunited! So fun to see my peeps from Pennsylvania. 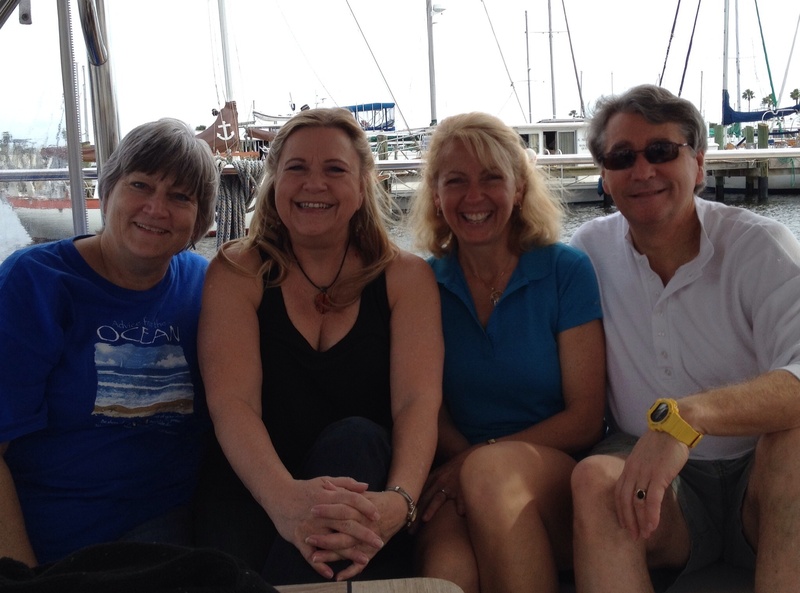 We had a great day of walking downtown Daytona, having lunch and hanging out on the boat . . . our first REALLY warm day! 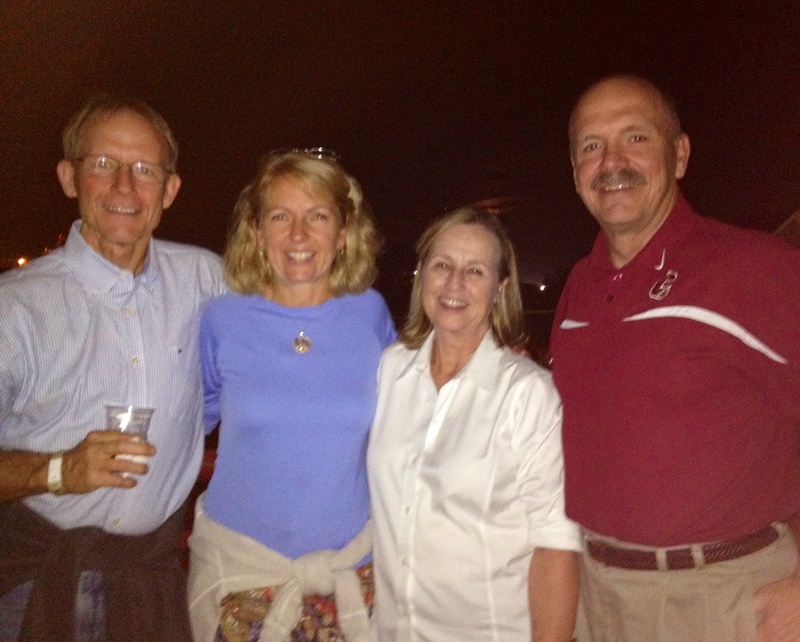 Reunited with Anne, Bob and Leigh! Being silly for the camera in front of Leigh’s old work place! Ironic that Anne and Leigh are both originally from Florida, moved to PA for a period of time, and then ended up back down here about 30 minutes apart from each other. They introduced me to Angell & Phelps candies. 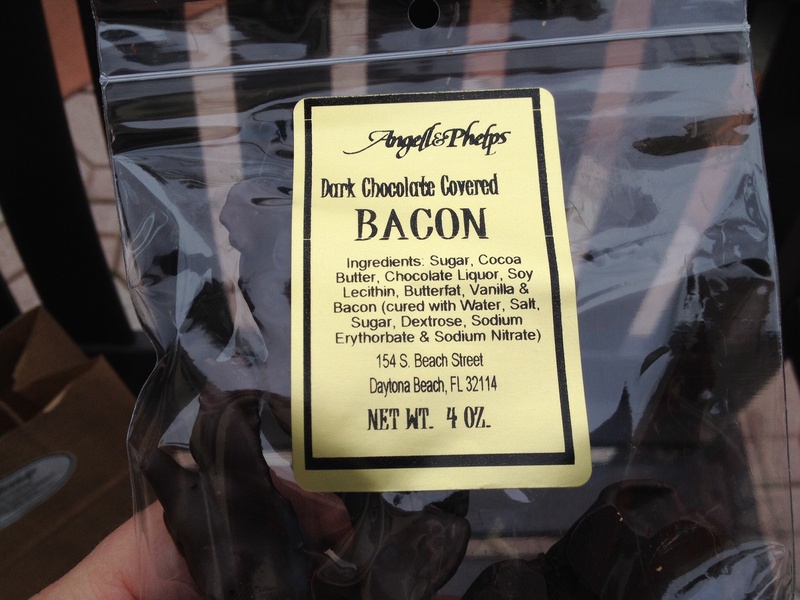 Don’t laugh, the chocolate covered bacon is AMAZING! I had to get some. 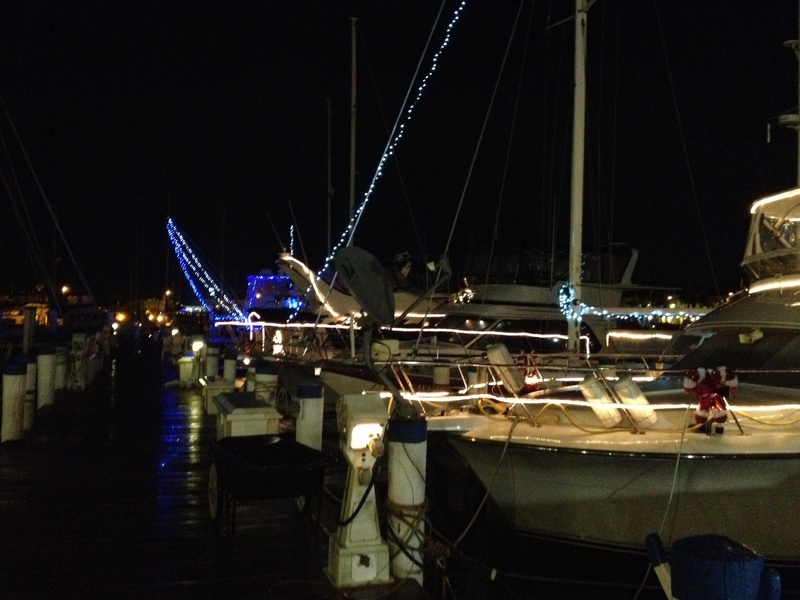 The further into December we went, the more boats we saw lit up for Christmas! 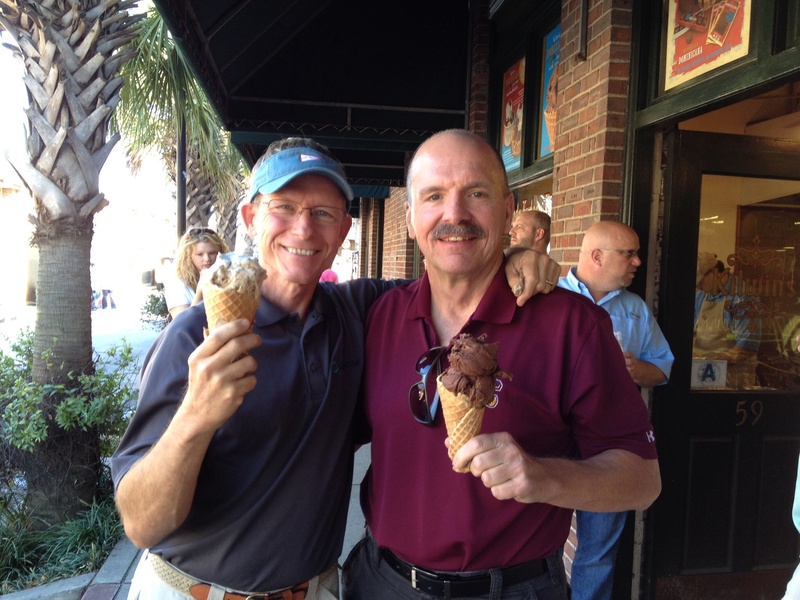 We enjoyed the first taste of some truly warm days in Daytona . . . and we were craving more! So after a very nice stay in Daytona, it was time for us to continue the trek south. We started peddling hard again, anchoring overnight in Titusville, stopping briefly in Melbourne where we met up with Magnolia again, and then heading on down to our next stop, Vero Beach. 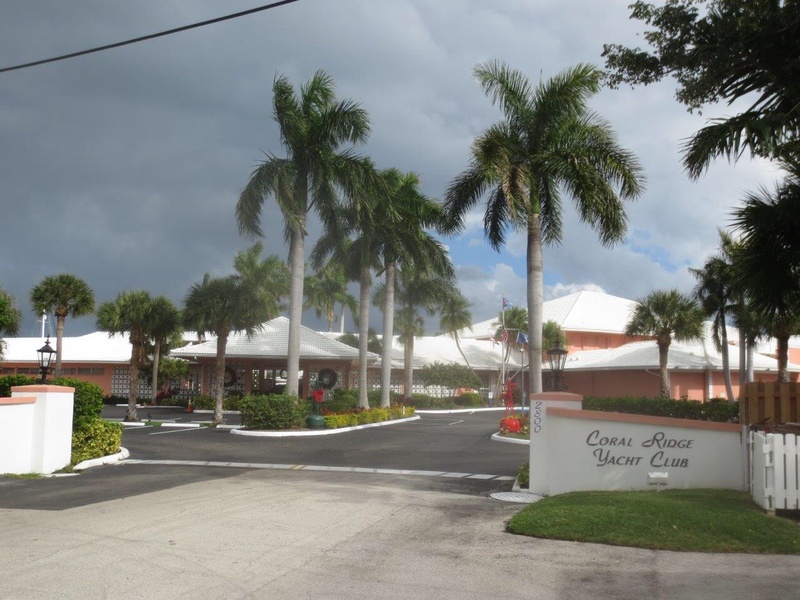 Vero Beach is an extremely popular stop for the cruising community, and many end up staying longer than they anticipated! 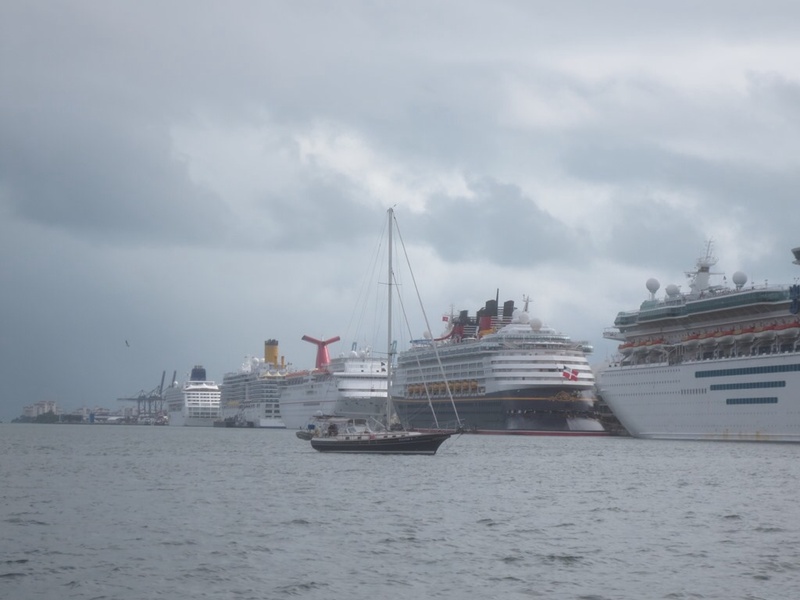 There’s also a number of cruisers who have ended up moving to Vero, thus earning it the nickname, “Velcro Beach,” since people seem to get stuck there. We enjoyed our two nights and also had to resist the urge to stay a little longer, but resist we did. 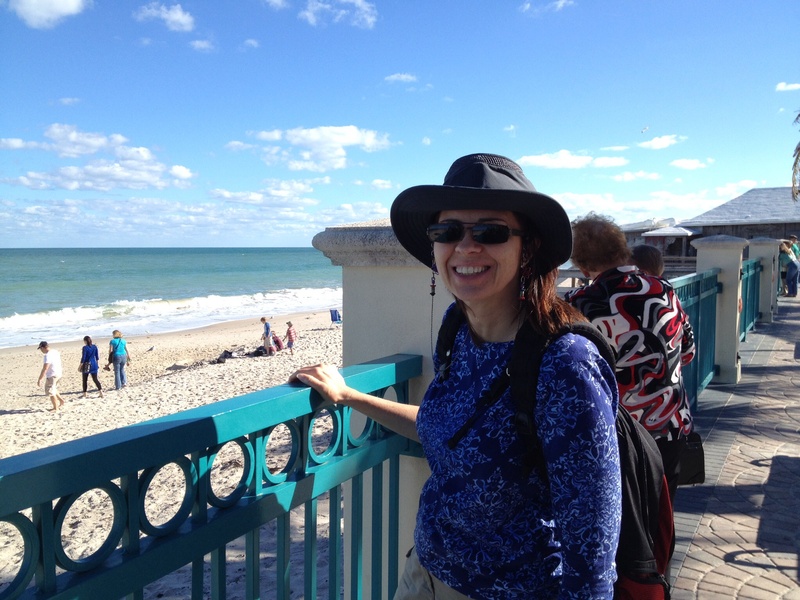 I’ll stop for now, but will give you a preview of the next post which will come up shortly: More on Vero Beach, Palm Beach, and the 18 bridge day to Ft. Lauderdale where we are spending Christmas with Magnolia. On that note we’ll say Merry Christmas to one and all!! 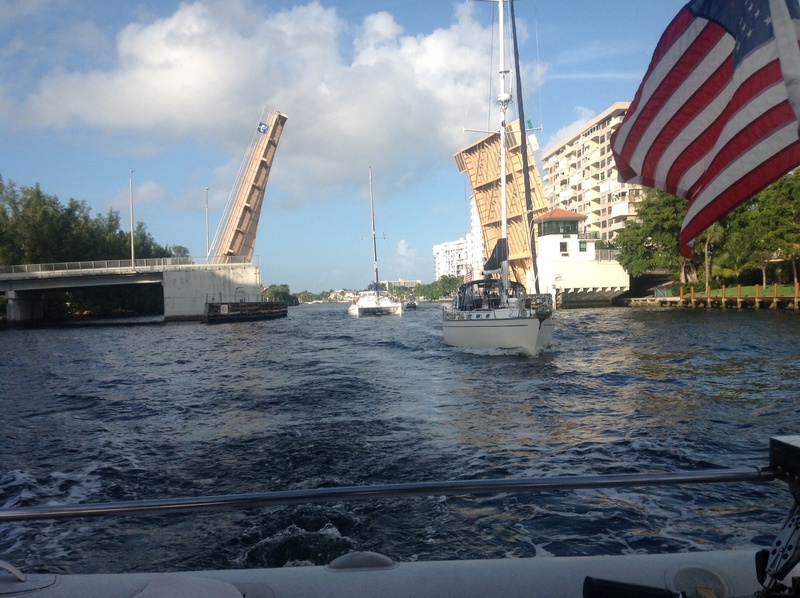 1) We have spent almost all of that time continuing down the Intracoastal Waterway. I refer to this as the “river boat cruise” portion of the trip – that is very much what it feels like. 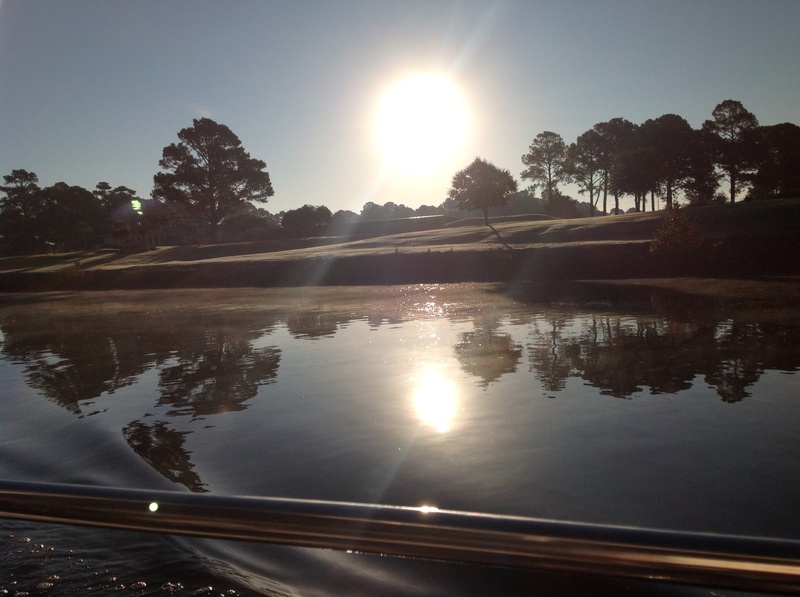 Through those travels, we’ve seen the different personalities of the waterway come out. South Carolina had golf courses and condos as well as some wilderness areas. Georgia became twisty and winding, but had some spectacularly scenic and quiet anchorages . . . it was generally less inhabited. 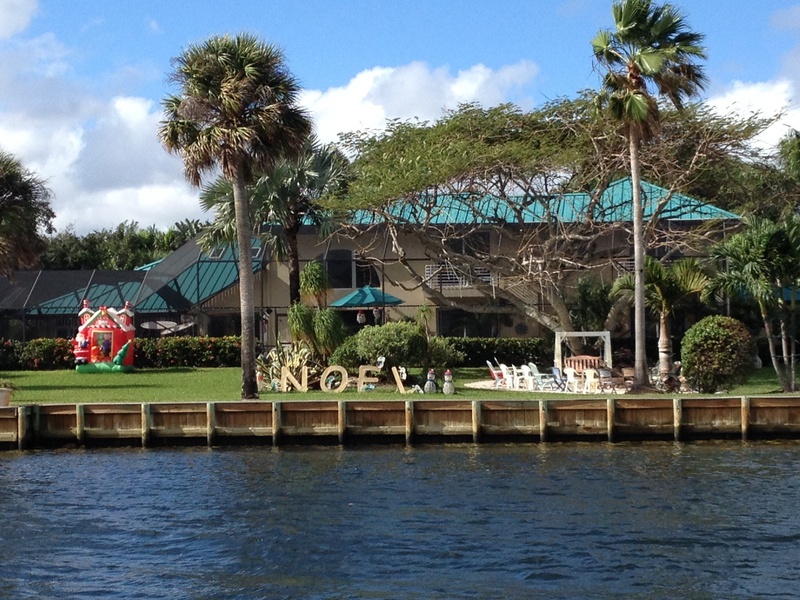 Florida started showing areas with very expensive homes with docks and lots of palm trees. We have enjoyed it all. However, we have about frozen our tooshies off, too! It has definitely been fall cruising. 2) The two most note-worthy stops along the way were Charleston, South Carolina where we spent time with long-time friends of Frank’s who are now wonderful, new friends of mine as well. 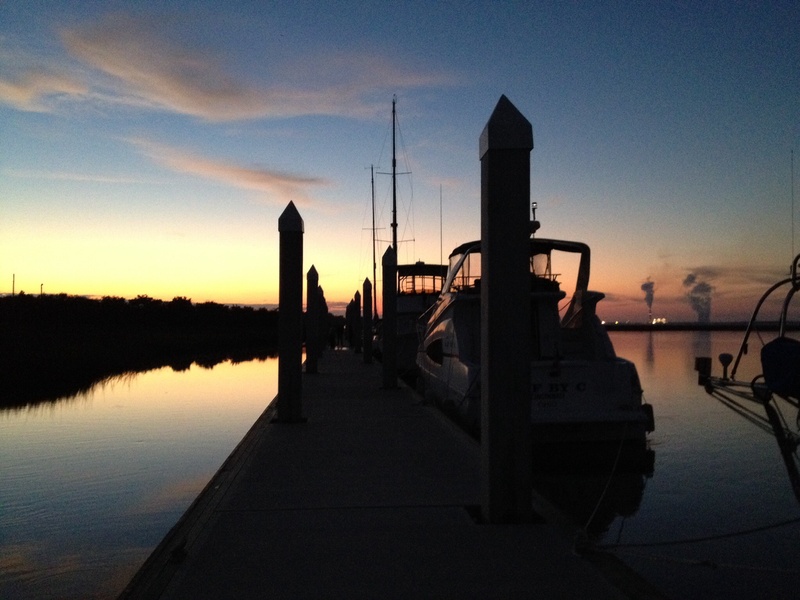 3) The second note-worthy stop was Hilton Head, South Carolina over Thanksgiving. There we met up with our friends on Magnolia and spent a wonderful holiday together. We refer to Annette and Anthony as our water family. So let’s get a little caught up. Golf Courses along the ICW in South Carolina. 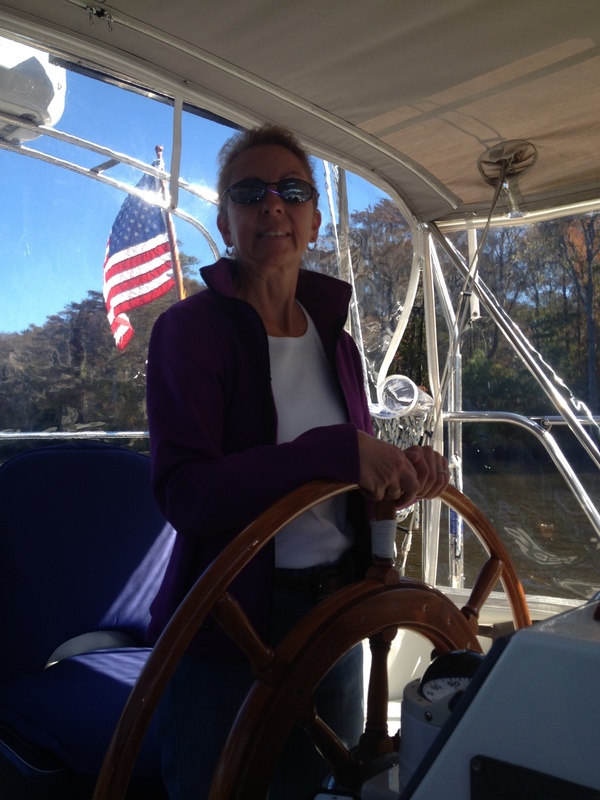 Ems at the helm on the way to Georgetown, SC. 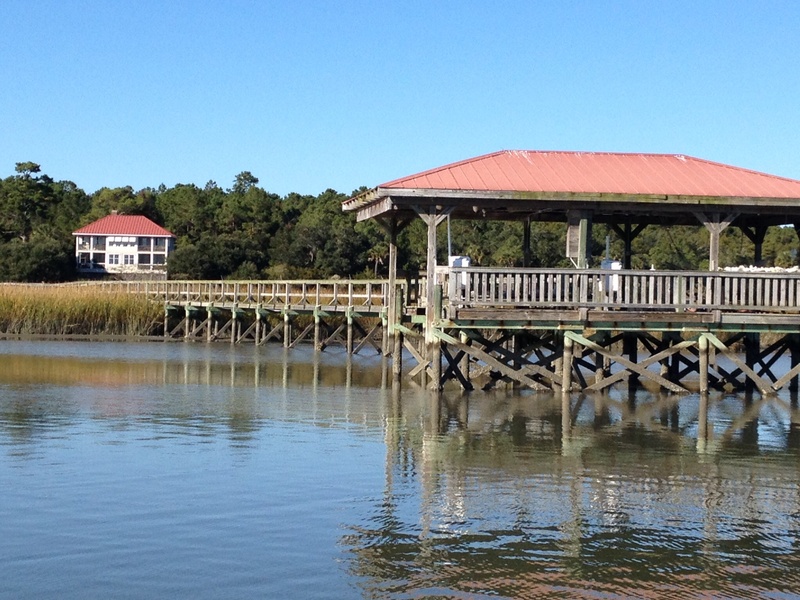 We stopped in Georgetown, SC for a few days to escape a cold snap . . . two nights in the low 30s. 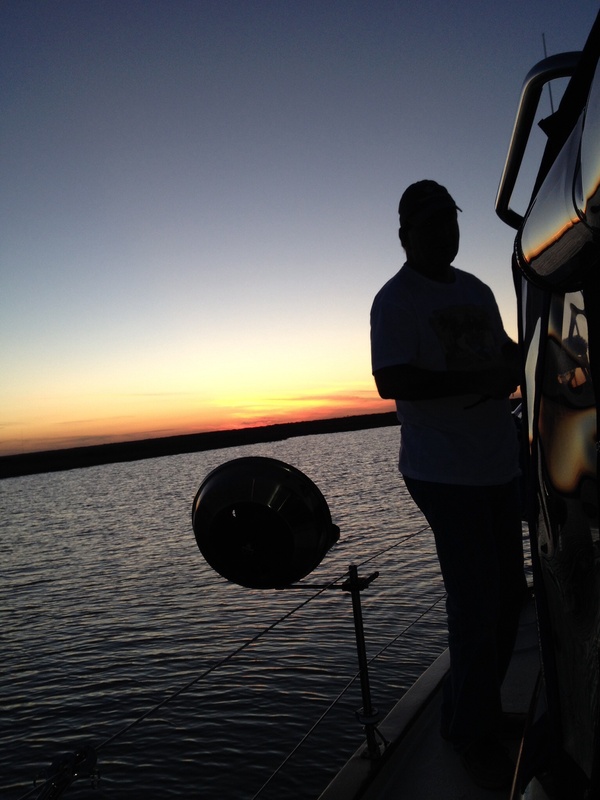 When it’s that cold, we make a point of being in a marina so we can be plugged in to shore power and run our forced air heat through the night (something that the batteries alone would not be able to do). 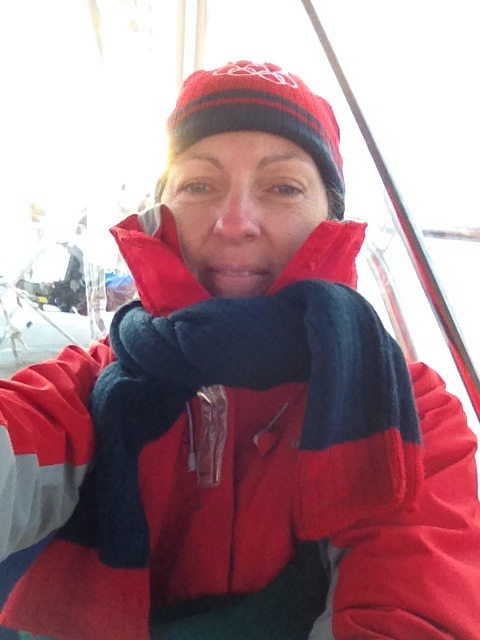 Although we have spent many chilly nights at anchor – the record low temperature in our bunk in the morning was 51 with the outside temperature of about 45 – getting into the low 30s is totally pushing it. 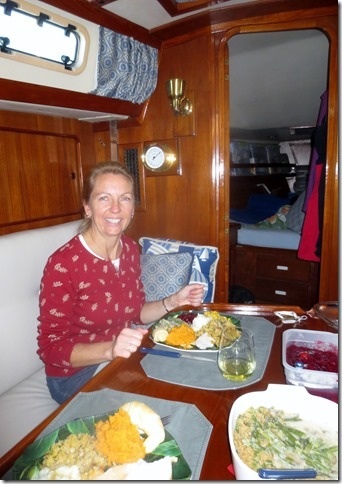 We can stay warm throughout a chilly evening at anchor by cooking and lighting the propane stove in our “saloon” – the nautical term for living room – but we do not sleep with propane running overnight. SO – that brings us back to Georgetown! Many cruisers love it. 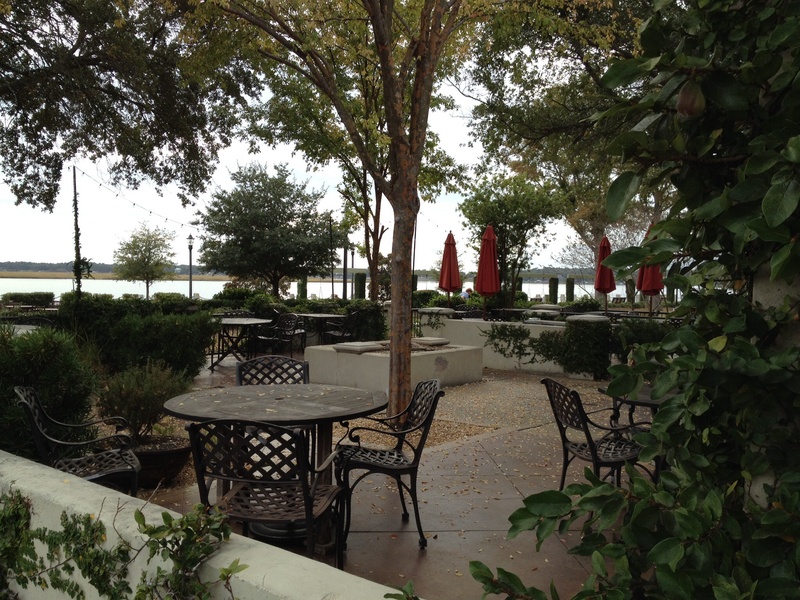 It is a convenient walk into the downtown area from the harbor and there are shops, restaurants and nice neighborhoods. But it is also rather industrial and I can’t say we found it to be the most warm and fuzzy place we’ve been. Wouldn’t rush back, but glad we saw it once. They suffered a rather devastating fire this summer which took out a block of downtown, but there is still LOTS of thriving downtown area and they are most certainly open for business. The portion of town that burnt down . . .
One of the many thriving restaurants in town. 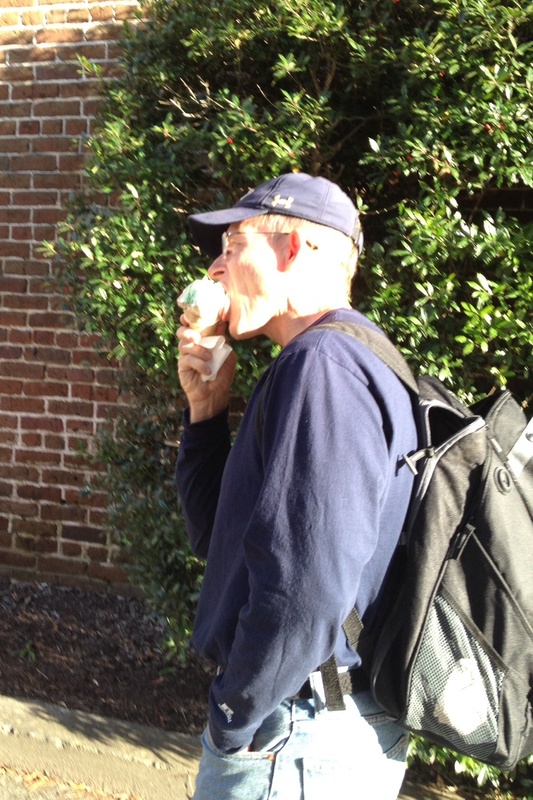 The day we arrived it was about 70 degrees, so Frank enjoyed an ice cream cone before the cold snap hit! Of course. 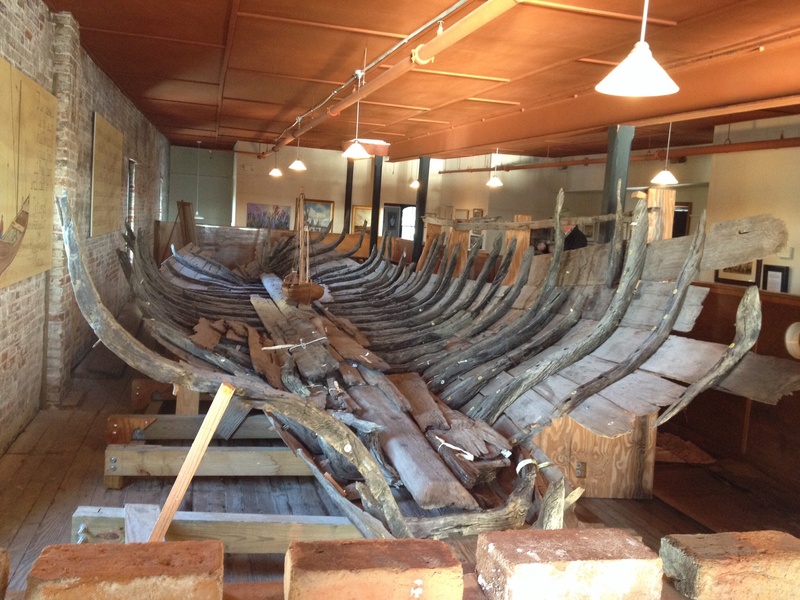 The “bones” of the Browns Ferry Vessel, the oldest know colonial vessel, found in the river near Georgetown . . . now preserved in the Rice Musuem. The next day got very cold as predicted, so we went seeking things to do inside. 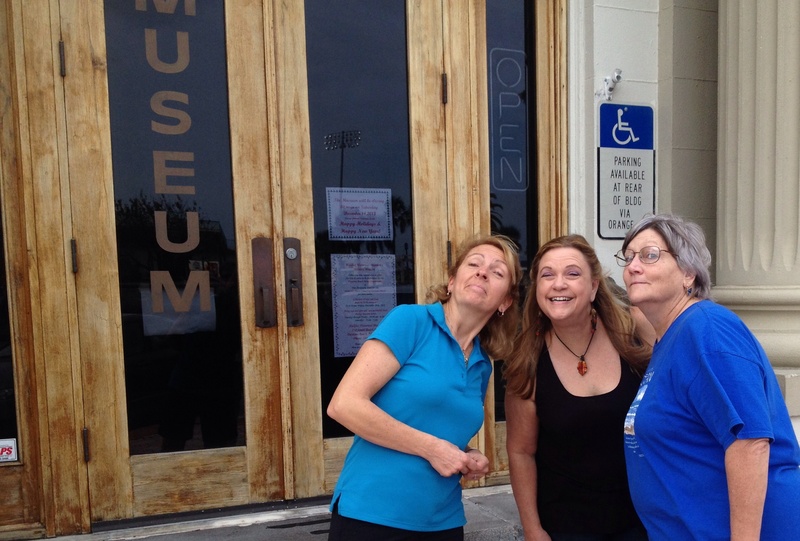 Some of you know, we are not the world’s best “museum people.” We feel like we should be better at it . . . we want to learn more about the places we’re visiting . . . and so, after hearing many nice things about the Rice Museum, we thought we’d give it a try. Yes, that is a museum about rice. Georgetown area was a huge rice supplier in the 1800s. I found the museum moderately interesting, although it felt a little bit like a training session at work that you didn’t really want to be in. I think Frank felt that the visit was an hour of his life that he’ll never get back. But it was warm inside! 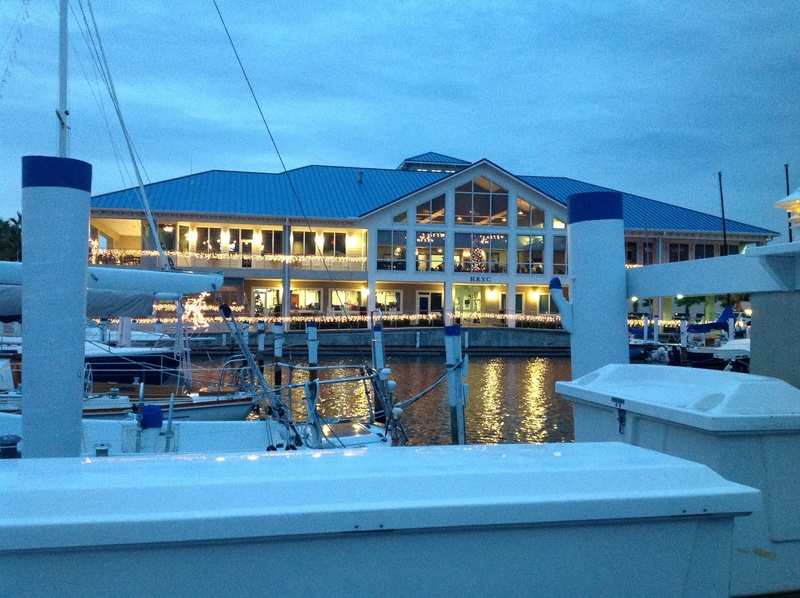 We met lots of nice people in the marina and had dinner with one couple that we had met before in Morehead City, so it was a congenial visit. We also picked up some wonderful fresh shrimp and oysters while there. But then it was time to move on. Another nice day on the ICW. 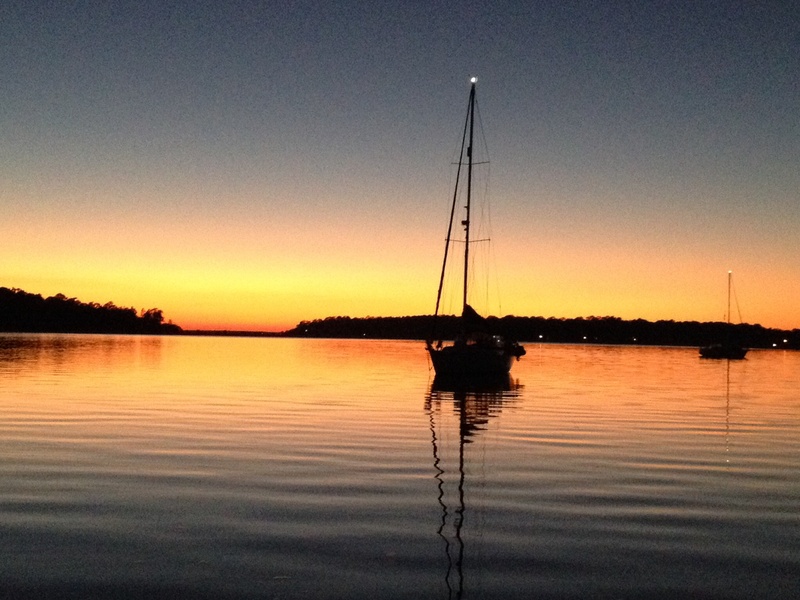 We anchored at Awendaw Creek and met up with Magnolia. This was a halfway point to Charleston. 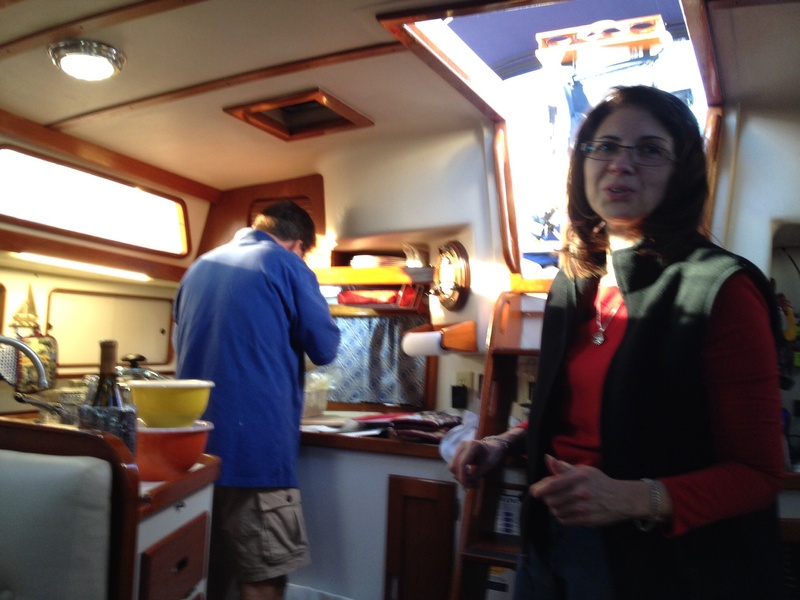 Anthony and Annette aboard Magnolia had us over for burgers on the grill! Leaving for Charleston at dawn. 1) Sunset happens a LOT earlier! Sunrise happens a LOT later! Duh, Mary Marie, you say! Yes, you have all been noticing that in your respective regions. Here’s what it means on the boat . . . a lot less travel hours in the day. Also, the ICW in the southern states can be very, very shallow in some areas, so we have to do far more strategic planning around what time high and low tides are, lined up with the “problem areas” that have shoaled up. There are some sections you just do not want to pass over at low tide. We find we are spending many more hours coordinating our travel plans with all these factors in mind. That has meant many early, early morning departures. 2) That leads to another noteworthy point in the above picture: Because we were leaving at the crack of dawn, Frank had worked very hard to maintain his night vision when we got up. That means using the red overhead lights instead of the white ones (standard in all boats for that very reason) and turning the brightness level down on all the equipment screens. That means that when we get behind the wheel and it’s still pretty dark, our eyes are still adjusted to the dark and we can see better. And then some knucklehead goes and forgets to turn the flash off on the camera and flashes it in your face. (Knucklehead = Ems). Oooops. It was an accident! Thankfully he had a good sense of humor about it – mostly because the sun was coming up fast. Then we were off to Charleston. 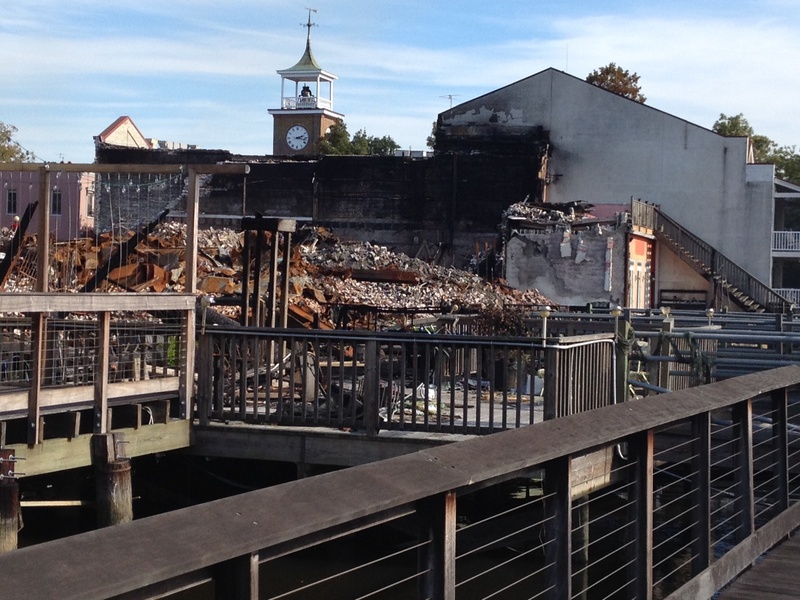 Let me clarify – the “other” Charleston. Understand, I grew up in Charleston, WV which will always be Charleston #1 to me. We had friends expecting us! But not so fast! 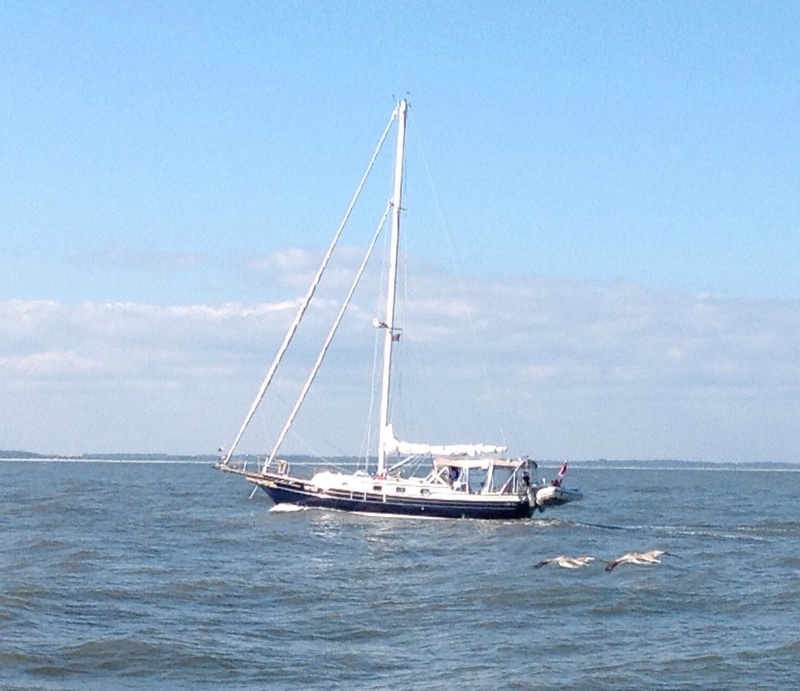 Just as we got into Charleston Harbor (which is quite big), we saw a rubber skiff (boat) approaching. Then I saw the blue light. Yup, it was the Coast Guard pulling us over. It’s like getting pulled over on the road by the police. We were going to be boarded. Here’s what that means: every boater knows that at some point in life, the coast guard will board you. They randomly stop boats and get on to inspect them to make sure they are in compliance with documentation and safety equipment . You show your ID, they take about 30 – 40 minutes walking through the boat with you and asking for all your papers and ID, making sure you have the proper number of life vests, fire extinguishers and various other equipment that are required for you to be legally operating on the water. We happily passed our inspection. While the young man from the Coast Guard was walking around with Frank, the young woman from Department of Natural Resources who came on board stayed up in the cockpit with me while I idled the boat around the harbor during the inspection. She kept saying, “you can continue on towards your destination – our skiff will follow you.” We were very close to our destination, so I didn’t go very far very fast. When the young man completed our inspection and gave us the all clear, they turned around to signal to the skiff to come pick them back up. Hmmmm . . . no skiff! Where did the skiff go?? They radioed their colleague. The engine on the skiff had died!! Awkward. The Coast Guard dude basically said, ‘This is very embarrassing, but our skiff is dead in the water.” We graciously offered to give them a ride back to the motorless skiff, which they sheepishly accepted. We even offered to tow them back in, but they assured us that, HA, they could call the Coast Guard to come get them! They thanked us profusely and said that many people are pretty resentful about being boarded and would have suggested they swim back to the boat! We don’t look at the boardings like that and are very respectful. And so . . . we rescued the Coast Guard that day. That’s our story and we’re sticking with it! I hope somewhere there is a gold star on our file. Priceless. 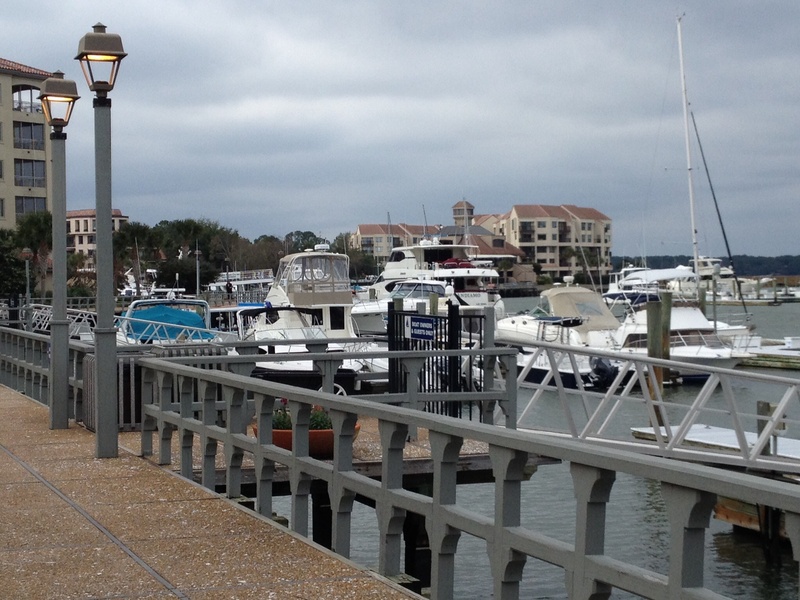 At last we arrived at the Charleston Harbor Marina for our visit! We settled in on our first night. 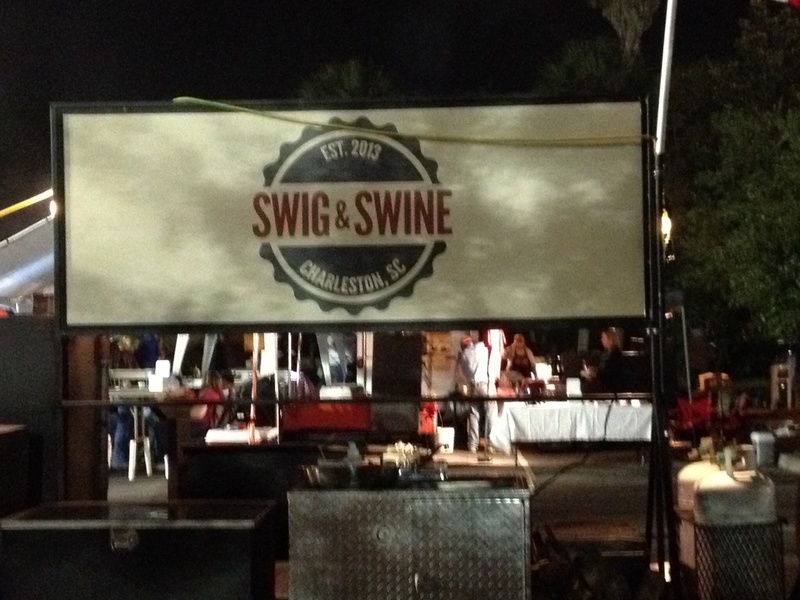 It so happened that there was a HUGE Barbecue Festival going on within walking distance of the boat, so that’s where we went for dinner. 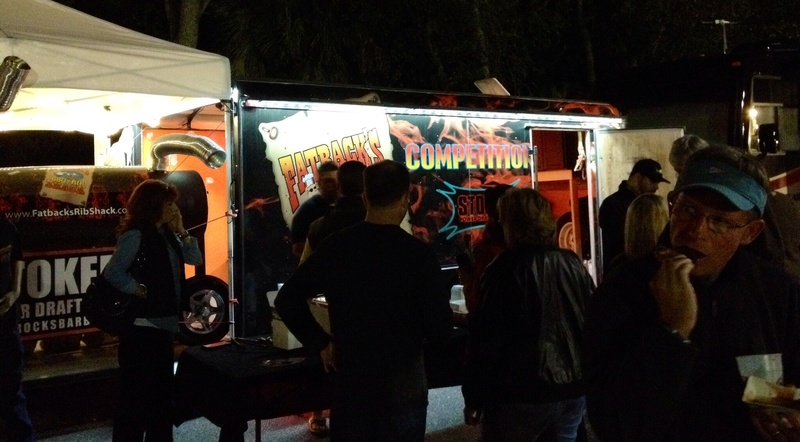 That night was the chicken wing competition. YUM!! 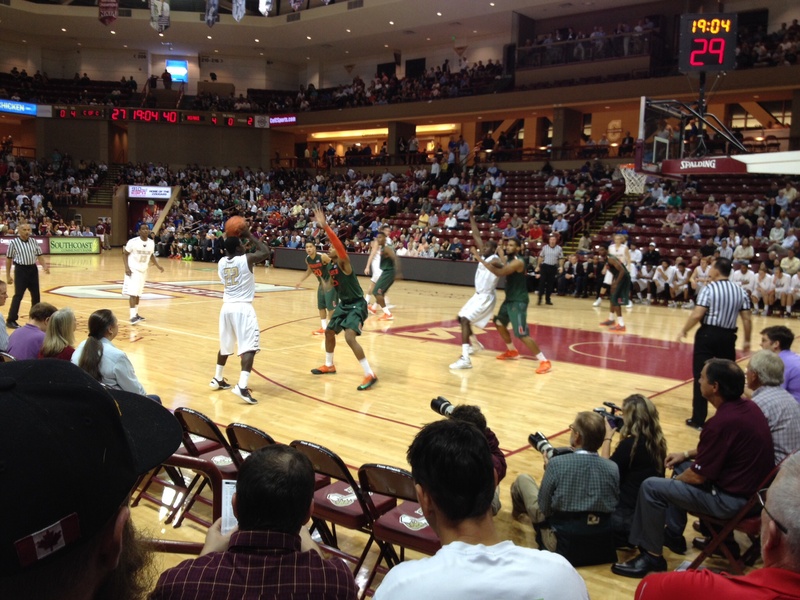 Here are some sights from that night. This was a serious competition!! And there was live music. How cool is that? Gotta love this outfit’s name . . .
And this was the most professional looking outfit around. They had the customized RV and everything . . . looked like a traveling rock band. Frank in front right sucking on a wing. 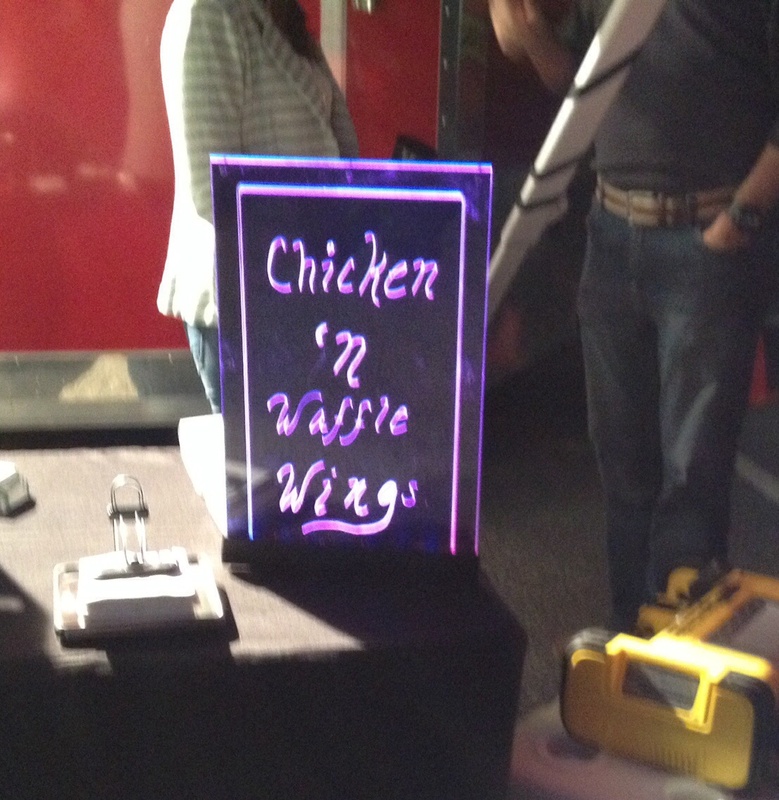 The chicken ‘n waffle wings are just sheer genius!! Here is the creator of the Chicken ‘n Waffle wings . . . that’s all I’m sayin’. We then spent several fun days with our friends Tom (aka O.D.) and Linda O’Donnell. Frank and Tom worked together in Atlantic City and have remained friends for years. We can’t thank them enough for their hospitality. 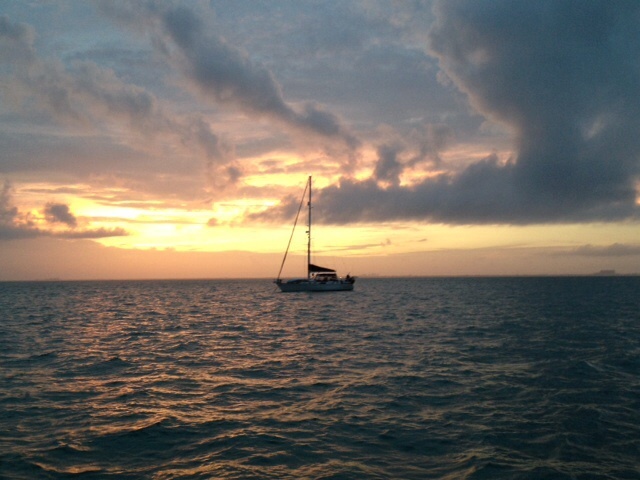 They even coaxed us off of the boat to stay at their house for a couple of nights – something hard to do! And they also offered that ever precious resource to us that wins a place in our hearts forever: a laundry room and unlimited hot water. They were the perfect tour guides and ambassadors for the city. Frank and O.D. 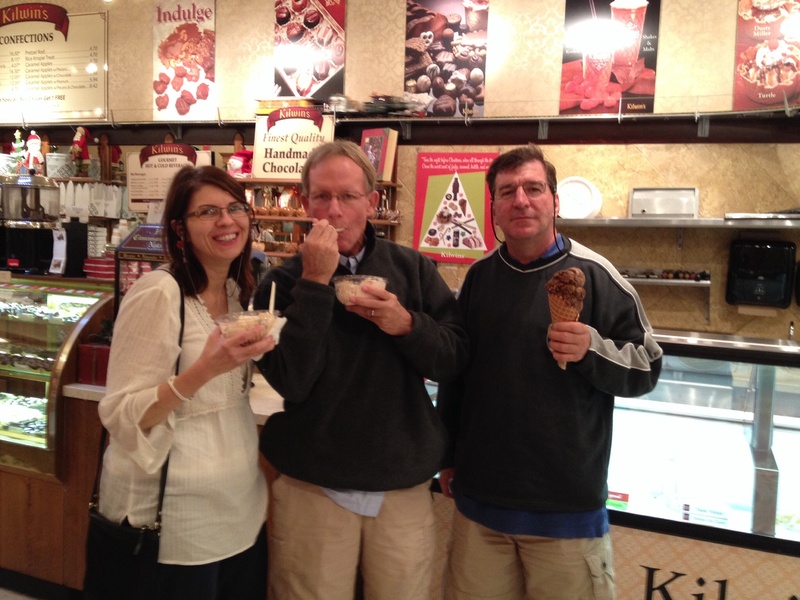 reunited and sharing their love of ice cream. 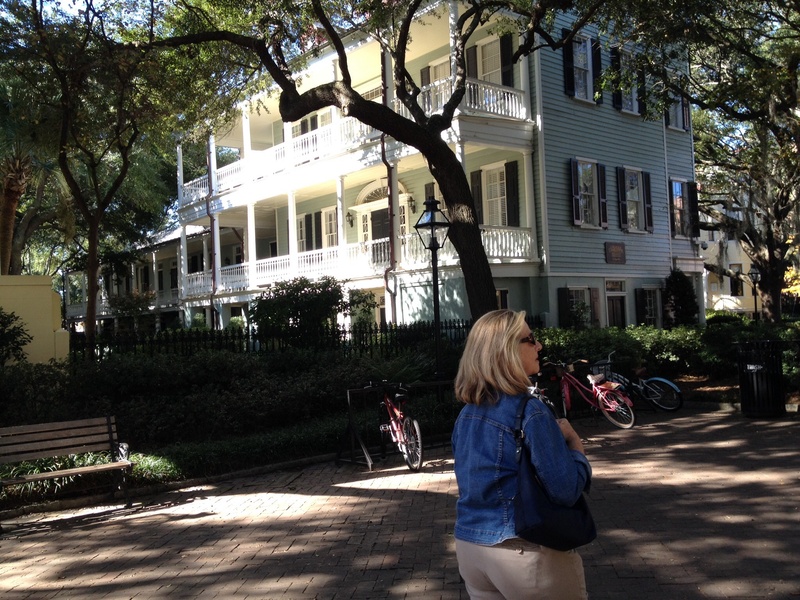 Linda showing us the sights around Charleston! 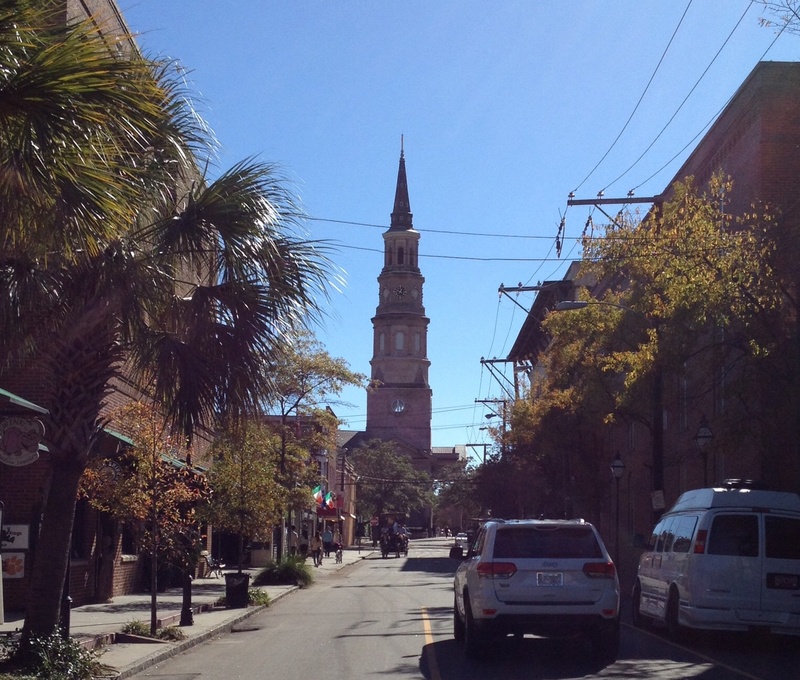 I never knew Charleston was referred to as “The Holy City” because of the vast number of churches and church steeples throughout. Beautiful architecture everywhere . 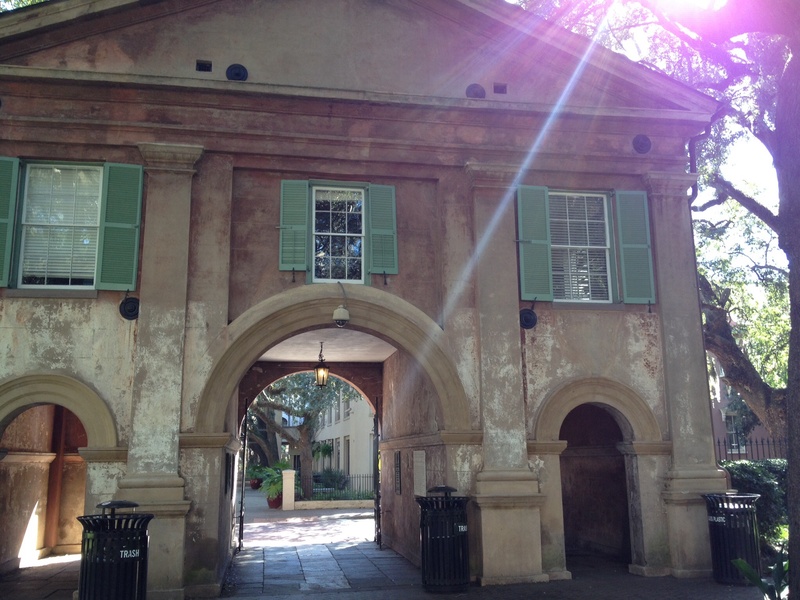 . . walking on and around the campus of the College of Charleston. 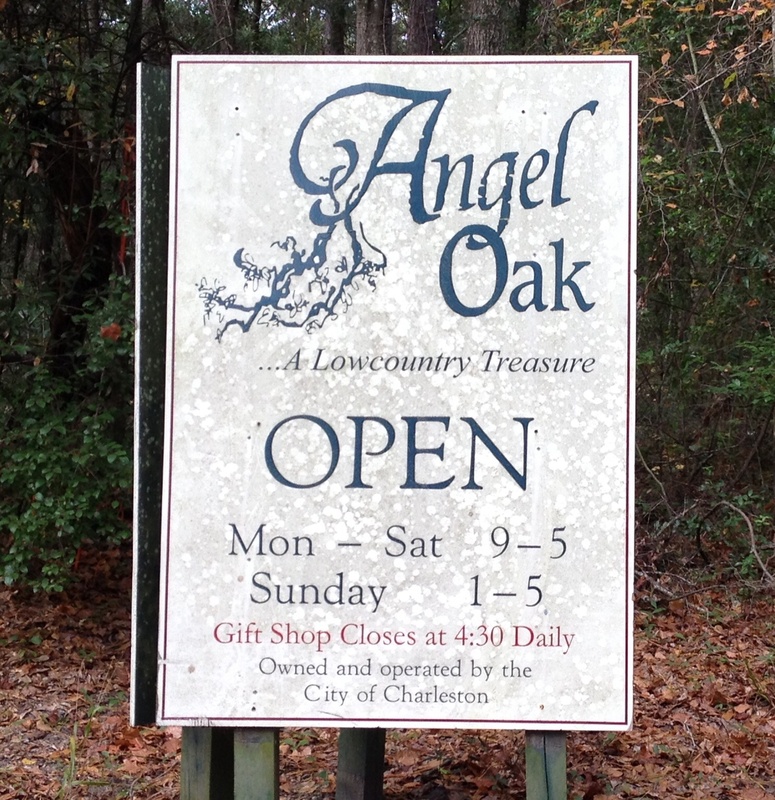 Being big fans of southern live oaks (which are different than your basic oak trees of the north), they took us to see the Angel Oak . . . thought to be one of the oldest living things east of the Mississippi, estimates have it’s age as being nearly 1,500 years old. You read that right. 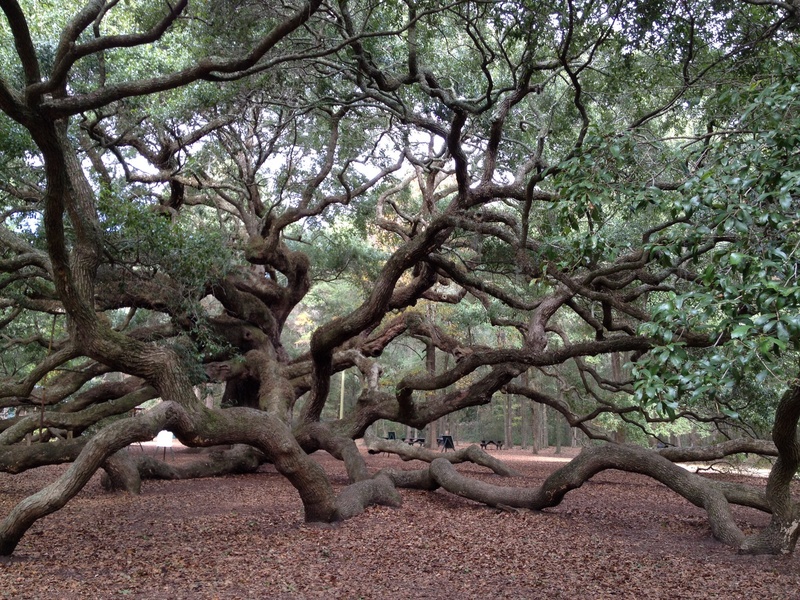 You really, really, really want to climb the Angel Oak when you see it . . . just magnificent! Irishmen and their Irish Whiskey! 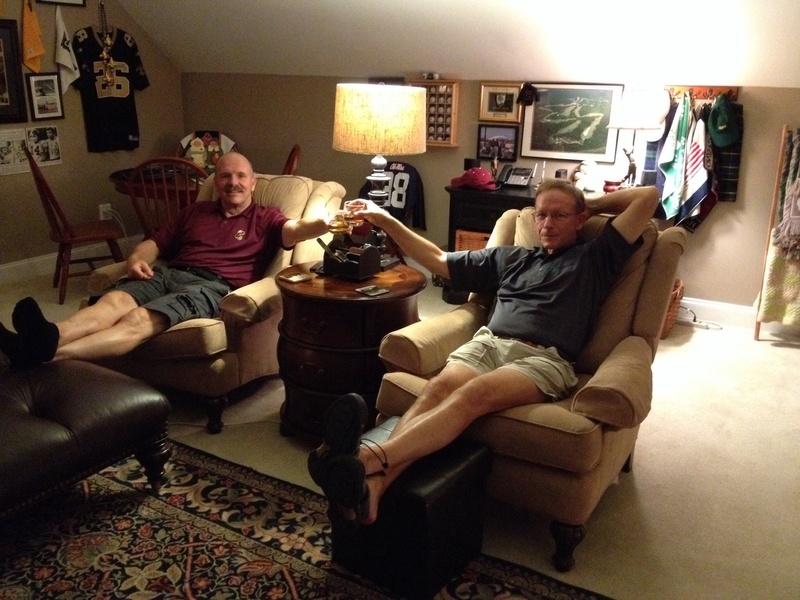 Here we are hanging out before the game. O.D. was a faculty member and Linda and O.D. are supporters of the college, so we got to take part in pre-game food and refreshment at the sports complex. Great fun! Thanks for a great visit, O.D.s!!! 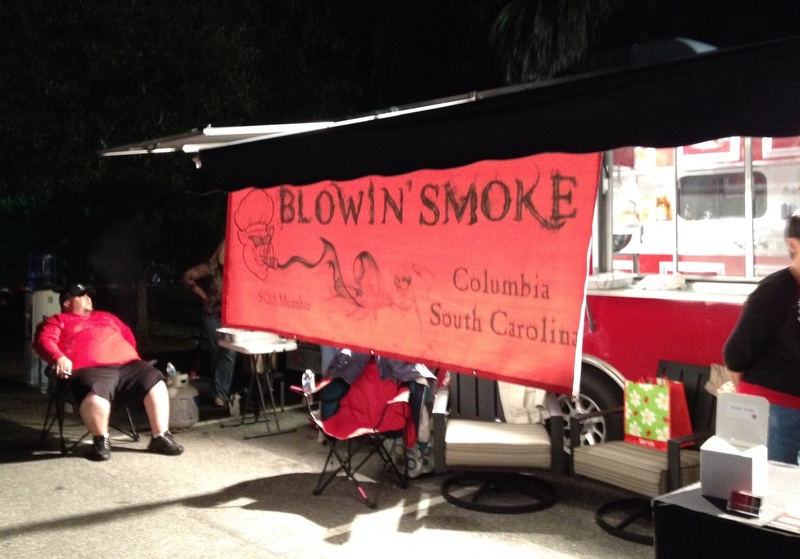 After five fun days in Charleston, it was time to move on. We had cleaned the boat, done some boat work, gotten our fickle starter replaced by a great, fair, wonderful mechanic (Luthers Marine Services = AMAZING). We no longer hold our breath when we turn the key on the engine . . . pretty important. 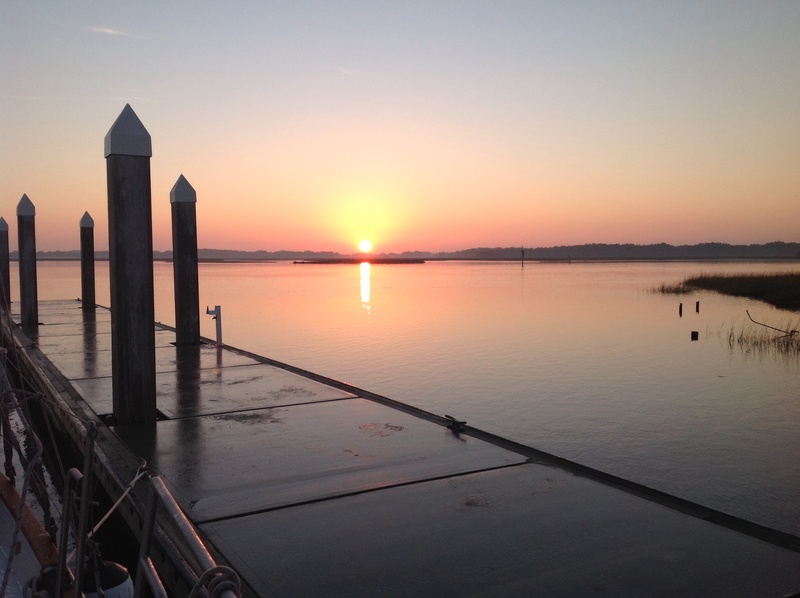 We headed towards our next town, Beaufort, SC (pronounced like you are saying “beautiful”) with a stop along the way at a peaceful anchorage. 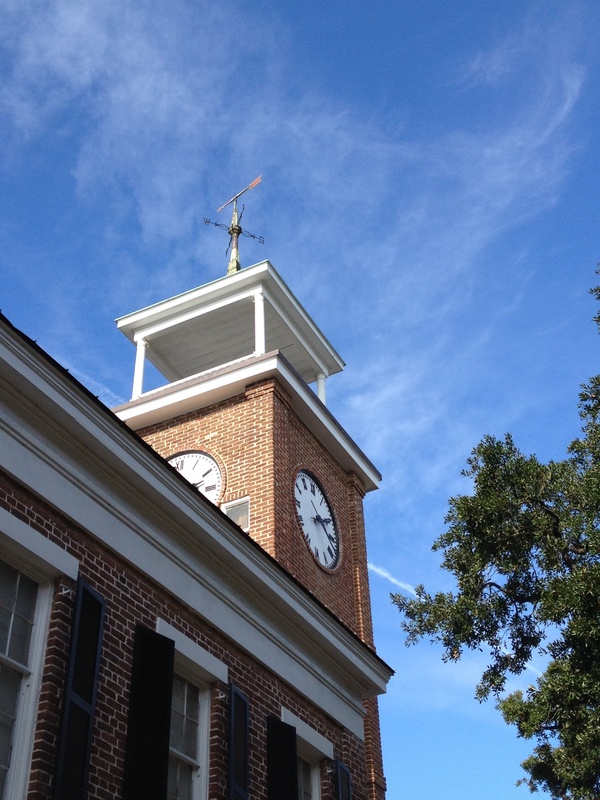 Beaufort is a pretty cool town. We would definitely put that on the “to do” list again for next year. A quiet anchorage except for the jumping fish. They weren’t jumping into our boat, though! 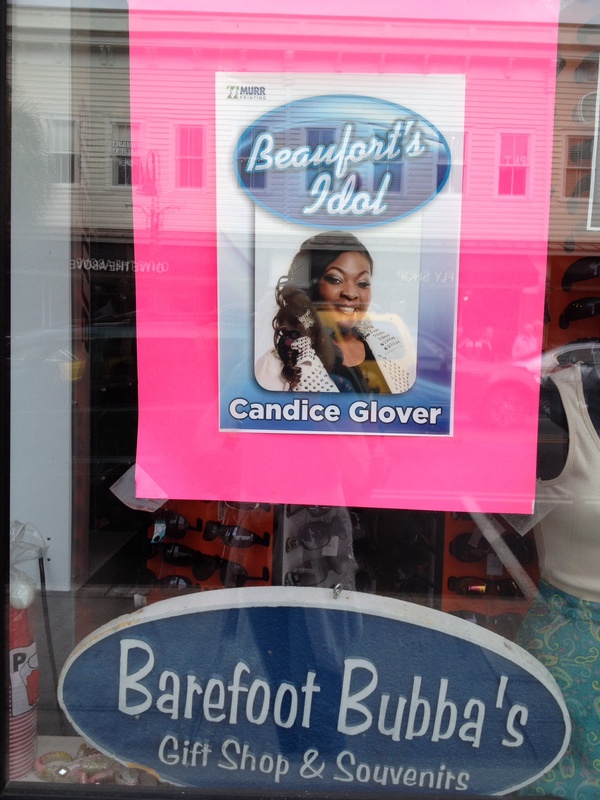 We were reminded that last season’s American Idol came from Beaufort. Go Candice! 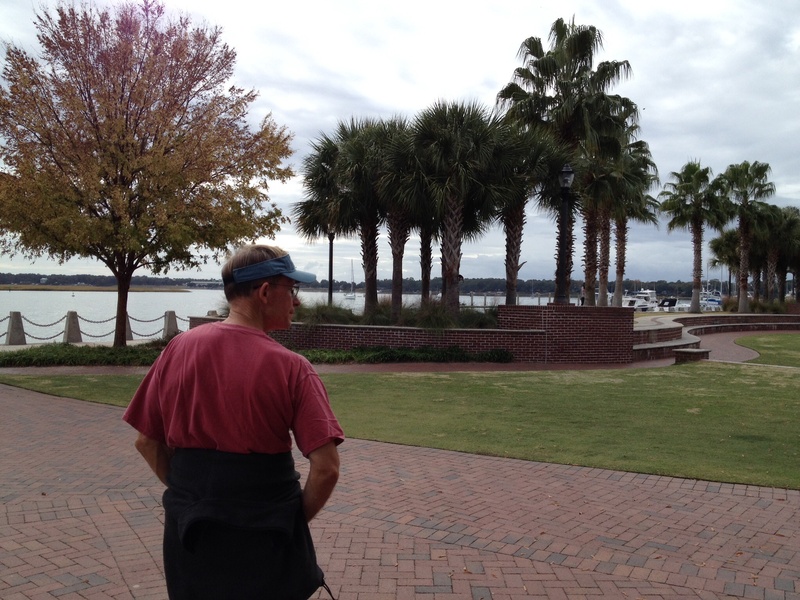 Walking the neighborhoods of Beaufort . 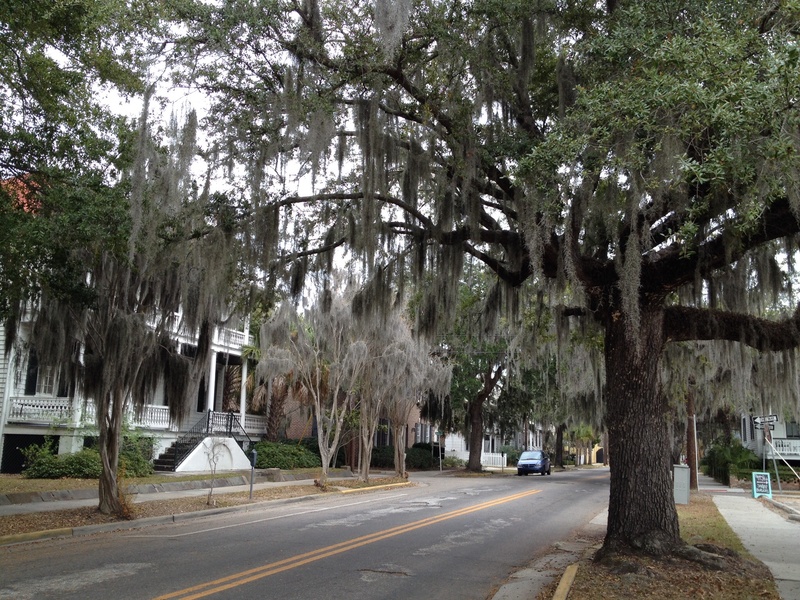 . . love the Spanish moss! 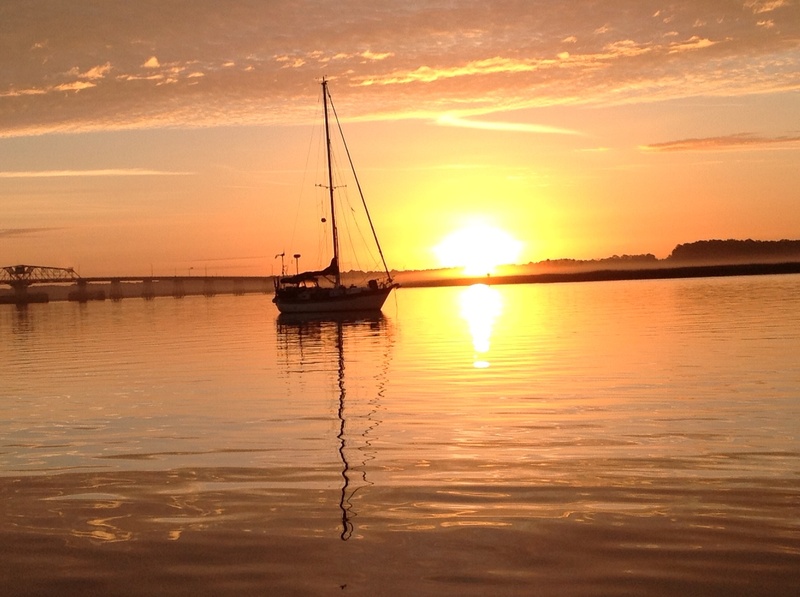 Sunset at the anchorage by Beaufort. This was the last nice night (weather-wise) for many nights. Another cold snap set in the next day. As I posted on Thanksgiving, we were reunited with our friends on Magnolia for the holiday! Here I am eagerly awaiting their arrival on a less than idyllic day on the water. Frank is at the dock ready to assist with the lines. There they are turning into the fairway. 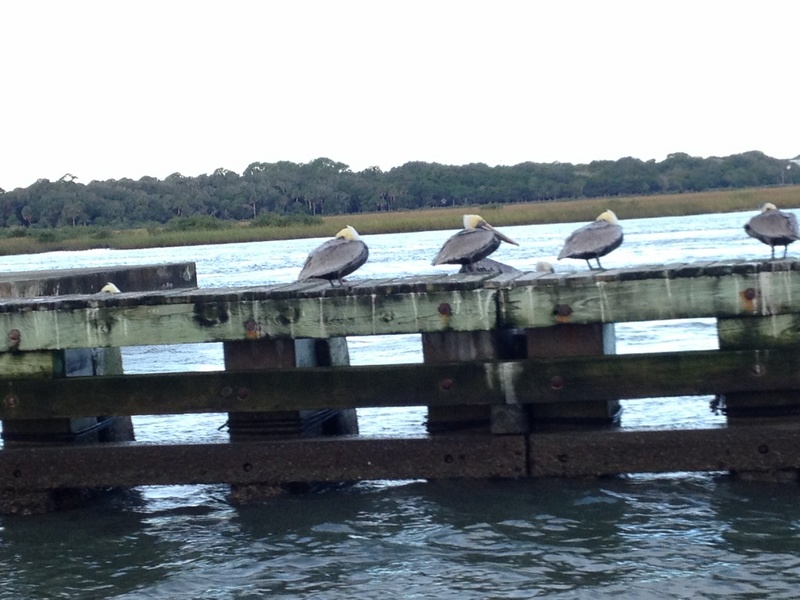 We did our best to enjoy some sightseeing around Hilton Head Island despite the 45 degree temperatures and 25mph winds. 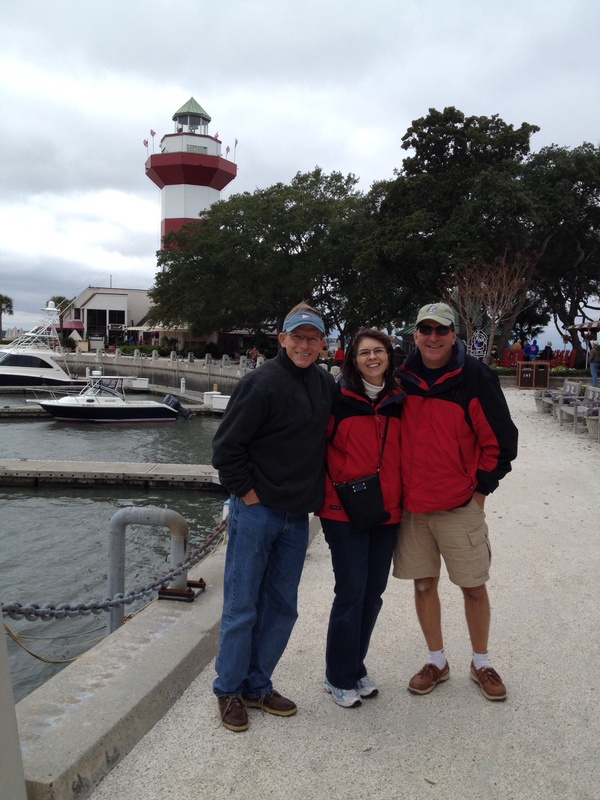 Anthony, Annette and Frank in front of the famous lighthouse in Harbortown. Okay, Anthony busted us flirting with Neptune in his Santa hat. A little windy? Shelter Cove was an old hangout of mine in earlier days. I was so excited to share it with the group and take a walk around. As soon as we stepped out of the car, we were almost frozen in place, so our visit was a very quick one. Thanksgiving morning was less windy and brilliantly sunny. 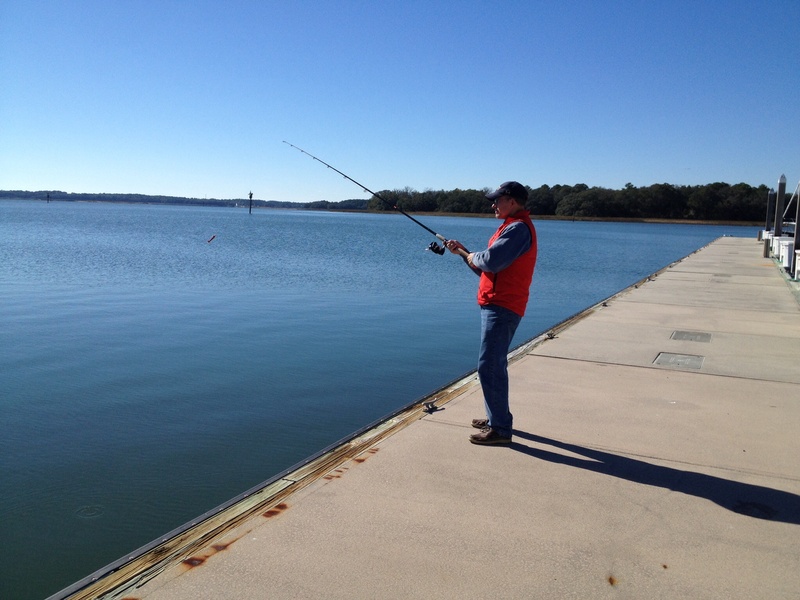 After visiting with family by phone, Frank tried some fishing off the marina docks while I prepped some side dishes for our feast with Magnolia. We did not have fish for Thanksgiving. Annette and Anthony hosted our feast on Magnolia. 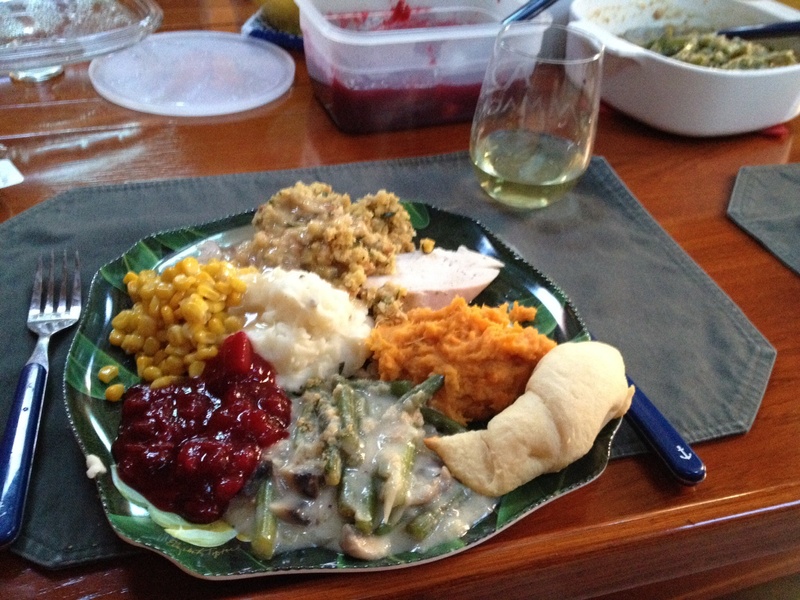 Annette prepared an amazing turkey breast and she and I split the side dishes. Magnolia made the pumpkin pie and Eleanor Q the apple. 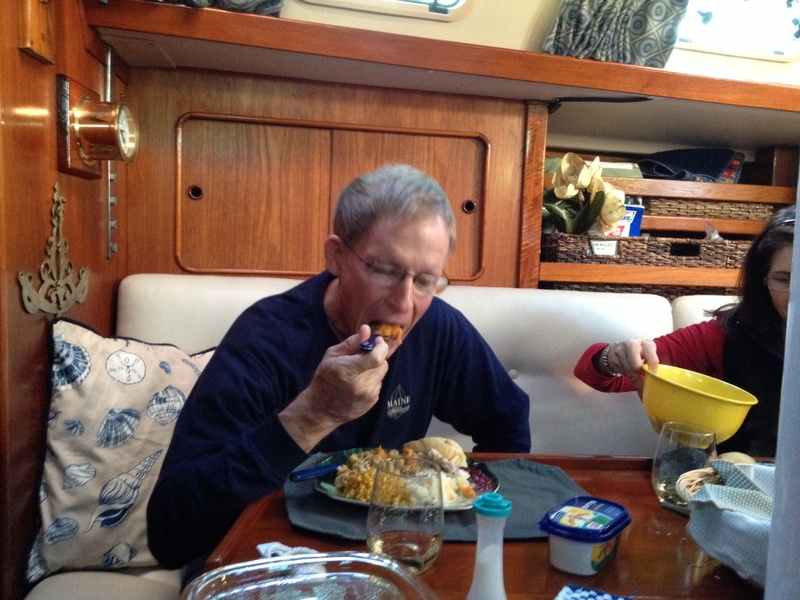 There was no skimping on Thanksgiving dinner just because it was on a boat! We worked our two galleys hard, and here are the results! 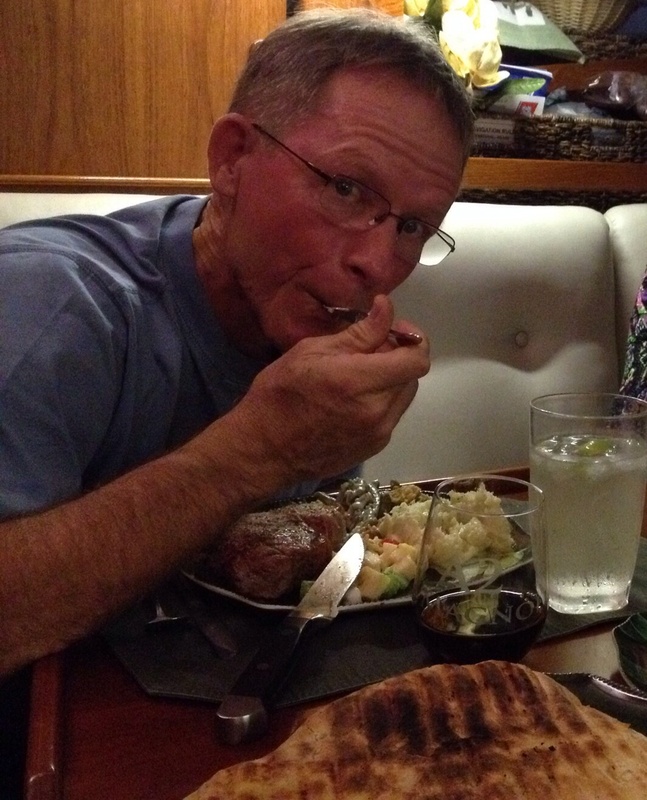 I was truly so stuffed after this meal I had to roll back to our boat. It was SO GOOD! Friday morning our two boats headed off to see Georgia next. We enjoyed our trip through South Carolina, but we were all getting in a hurry to get south fast and get warm! Magnolia leading the charge to Georgia through the bridge. Another great shot of Magnolia at sunset. We wore all the layers of clothing that we had on the boat. When the sun is out, the enclosure warms the cockpit up nicely, but on cold, cloudy days, it is RAW! Jimmy Buffet does not write songs about this part. 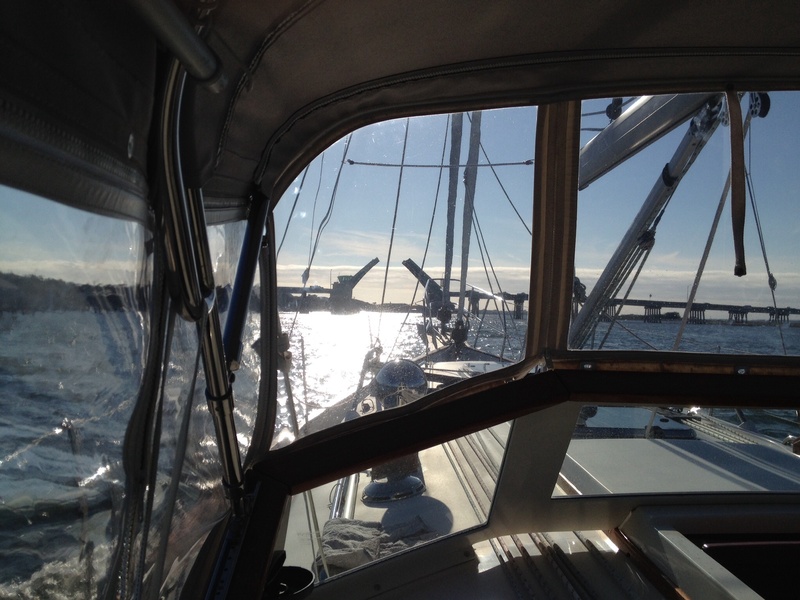 A few days later, our southbound team rafted up close to St. Simons Sound to prepare for an opportunity to go offshore at last! 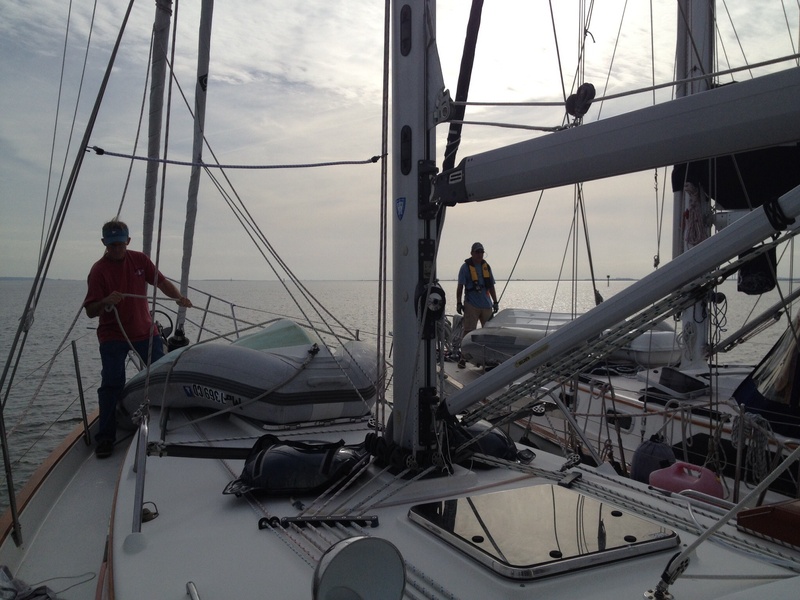 And the next morning, we are out St. Simons inlet and back into the Atlantic Ocean. 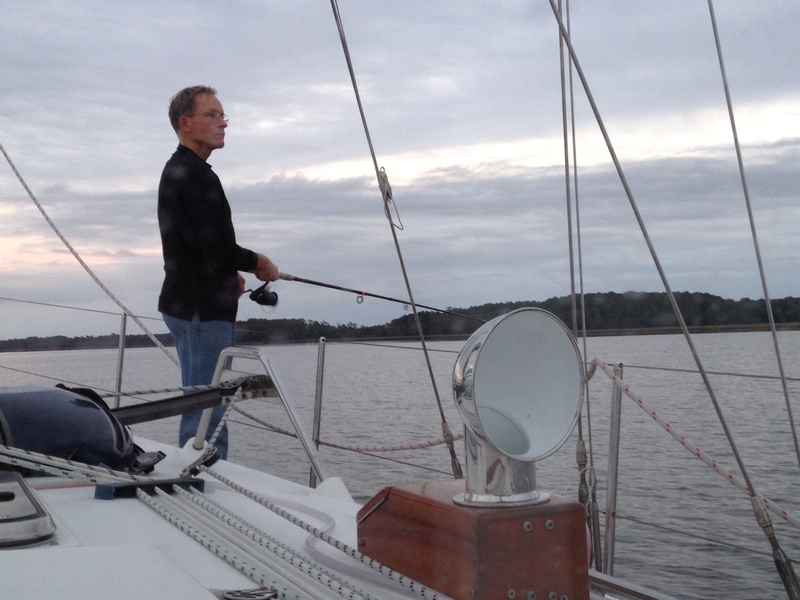 And so, we temporarily said goodbye to the ICW, waved goodbye to Georgia until next year, and headed out to sea. Destination: FLORIDA!